There is so much happening these days that it is hard to recall and record it all! We are grateful for the many open doors of opportunity the Lord has given us through which we are gladly walking. I am happy to report that the outreaches that were made into the interior of the Metu Mountains are bearing fruit. 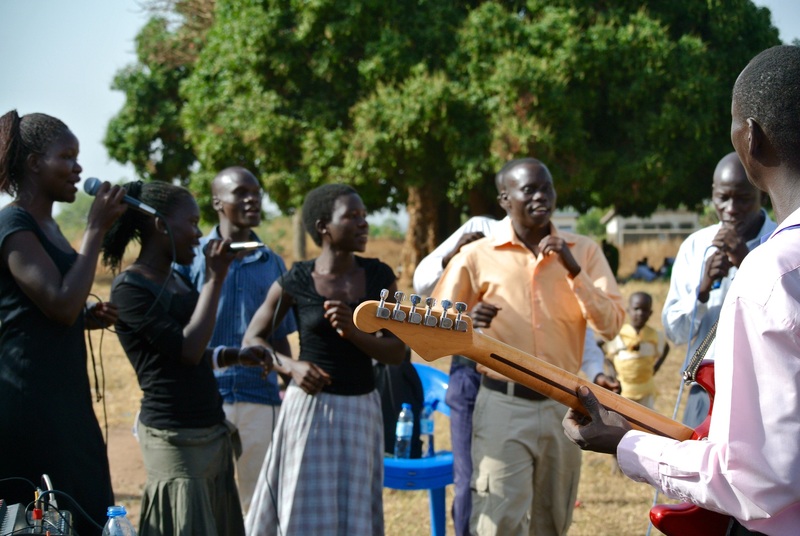 In the last outreach to Oyo there were 21 professions of faith. 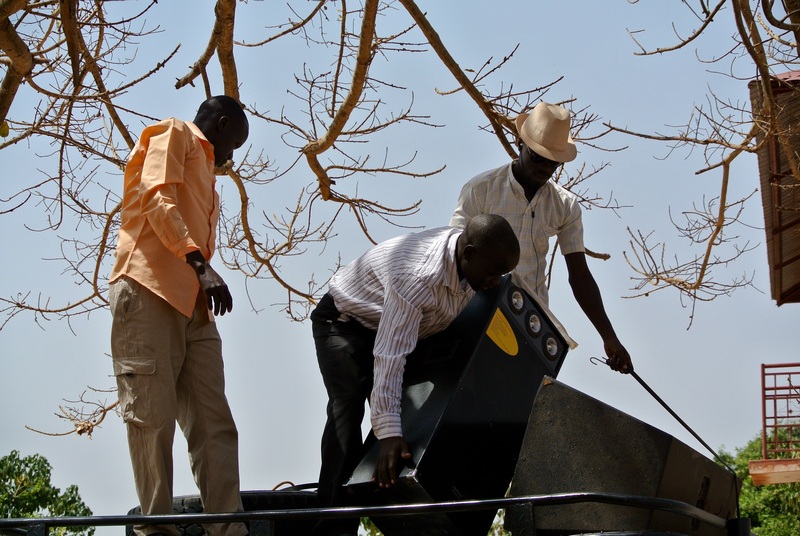 [This is the big difference in planting the seed in this region vs. the Yumbe area, where Islam is deeply rooted. In one area the “harvest sickle” is “bringing in the sheaves,” whereas in the other the seed is being scattered but we do not see yet and may not even see in our life time whether any seeds have taken root and are growing. We press on in both cases.]. It is now our big priority to ensure the discipleship process in the Metu mountains is done thoroughly and that shepherds are set in place to oversee the dear ones the Lord has saved by His sovereign grace. Tobias and Geoffrey are doing a great job. 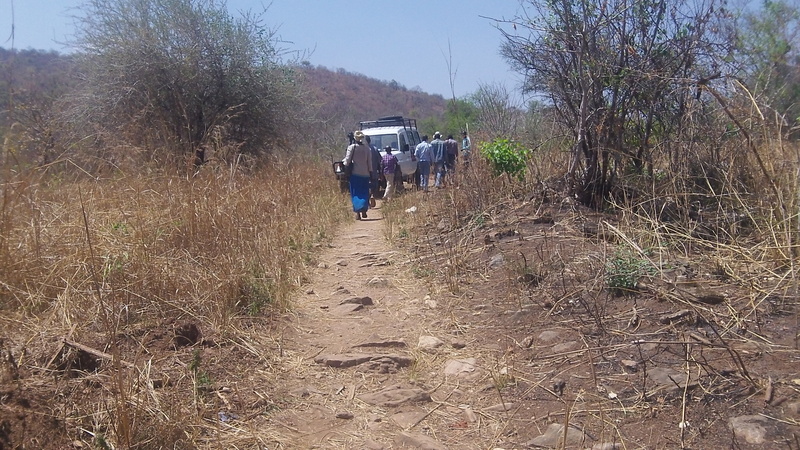 We are developing a strategy together for watching over the flocks that are scattered throughout the various hard-to-reach villages, many of which cannot be reached except by foot. 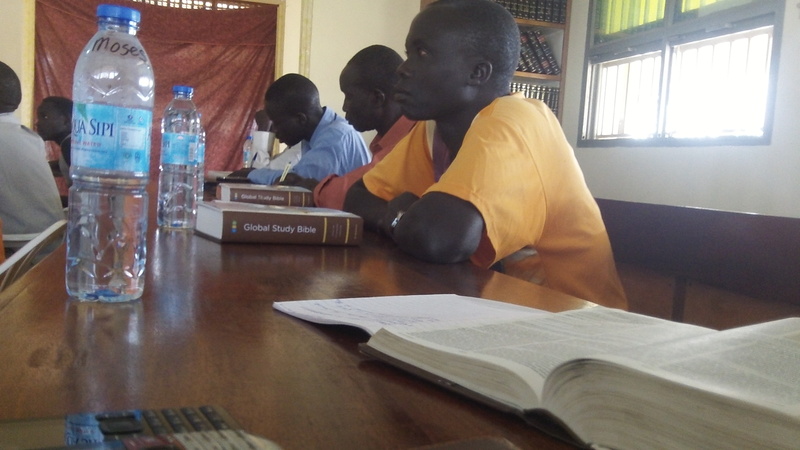 We are working together in training several young men as disciple-makers and overseers. Tobias, Geoffrey, and several others are planning an area wide retreat at Aya Baptist Church for all the new believers to come together, receive teaching and encouragement and to fellowship with one another. Our goal is to come alongside these key leaders and help them to be successful in their goal of being faithful shepherds over God’s flock. 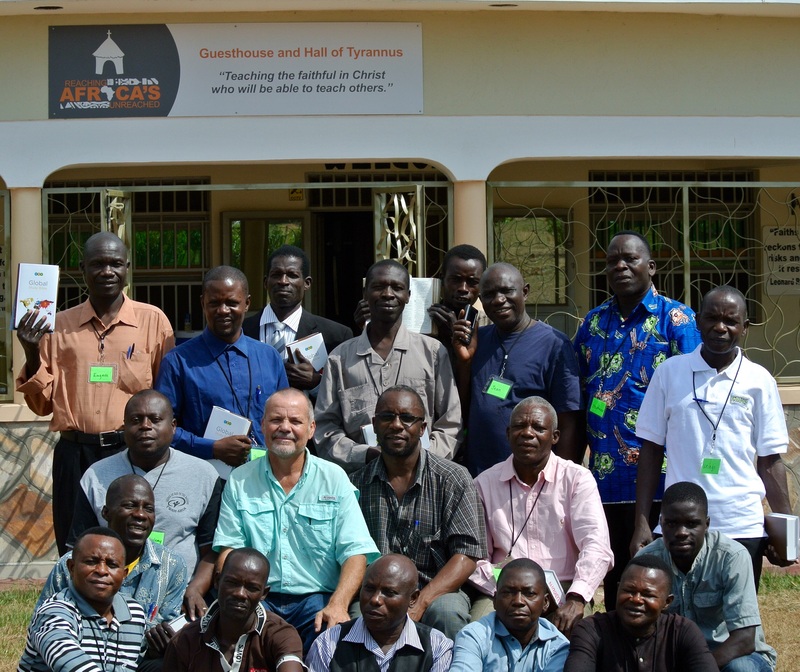 Last week we held our 12th Pastors’ Retreat. Brothers from D.R. 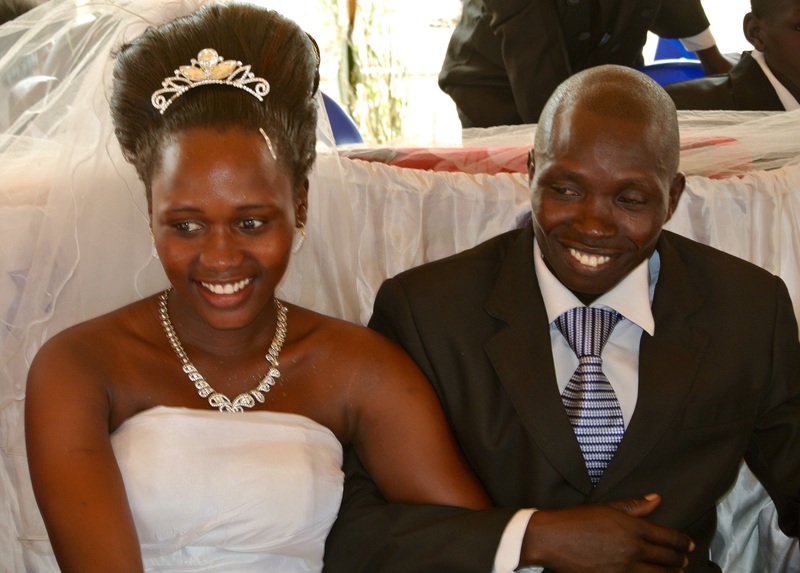 of Congo and Arua were in attendance. We never grow tired of seeing the fruit of these retreats: joy and progress in the faith. 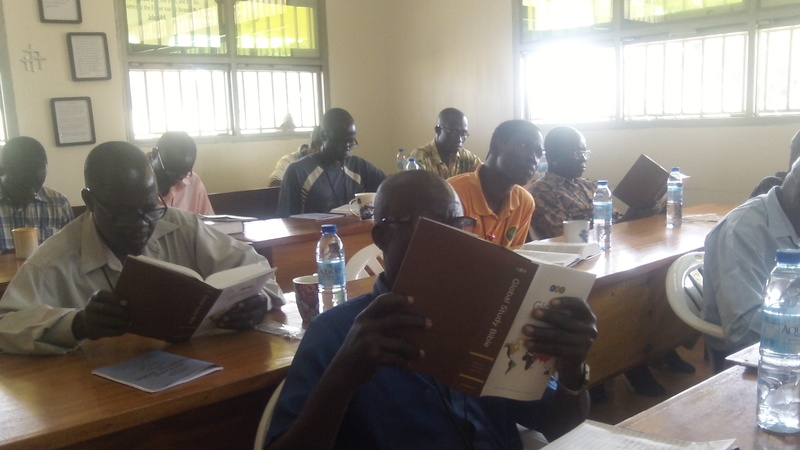 We want to equip and encourage as many pastors and church leaders as possible. On That Day, we will look around in wonder and celebration at the eternal fruit born by every effort made to reach the unreached with the Gospel. That inspires and energizes us to keep on doing what we are doing! 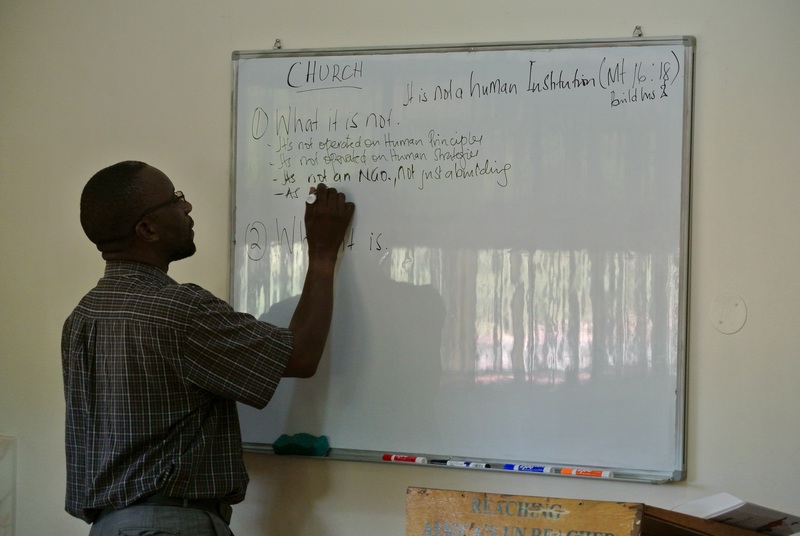 Pastor Bob Gad presenting his teaching on what the church is and what it is not! Fully loaded with resources and ready to go and rock their world! 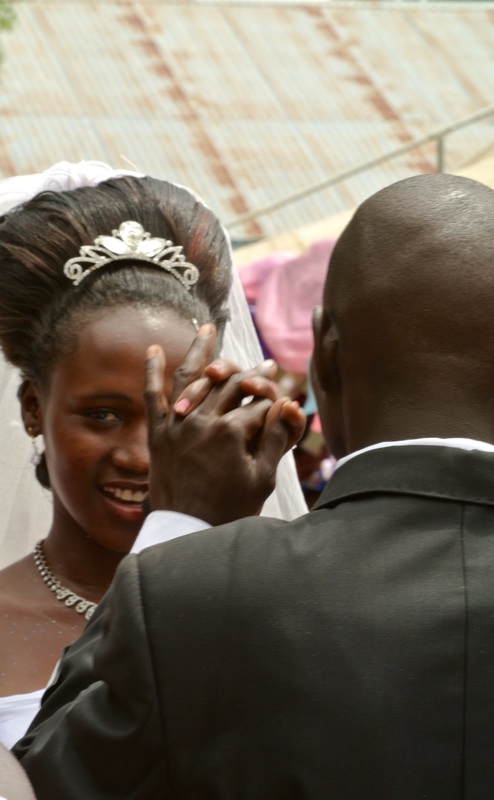 On Saturday, the 21st, we attended the wedding of Dominic, who runs the New Life Radio Station, and his wife, Gloria. It was a beautiful and encompassing celebration! So many people came to watch the ceremony and enjoy the lavish meal they prepared. 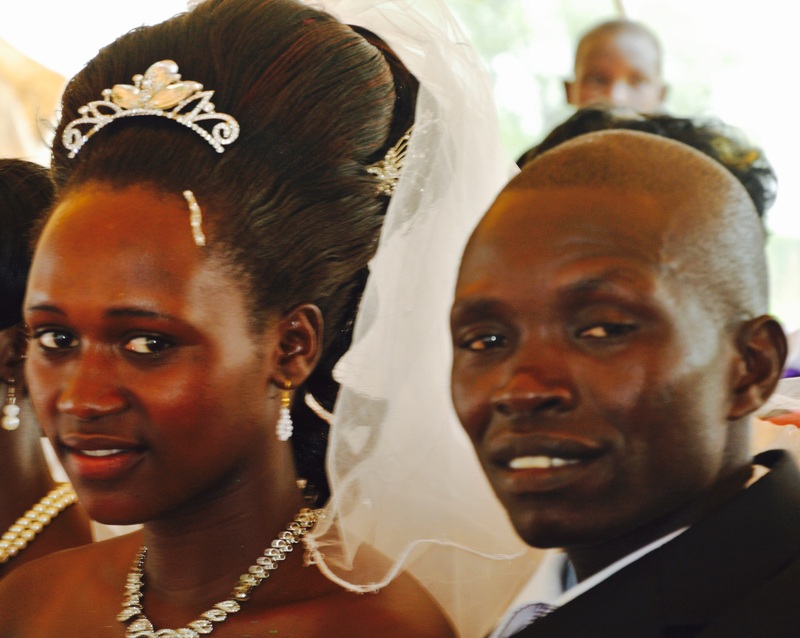 Dominic and Gloria managed to feed nearly the whole town of Laropi. I was able to capture some pictures of that happy day, but it was as if I were a part of a large group of paparazzi, trying to squeeze my way to a good shot! Dominic is doing a lot with what he has. 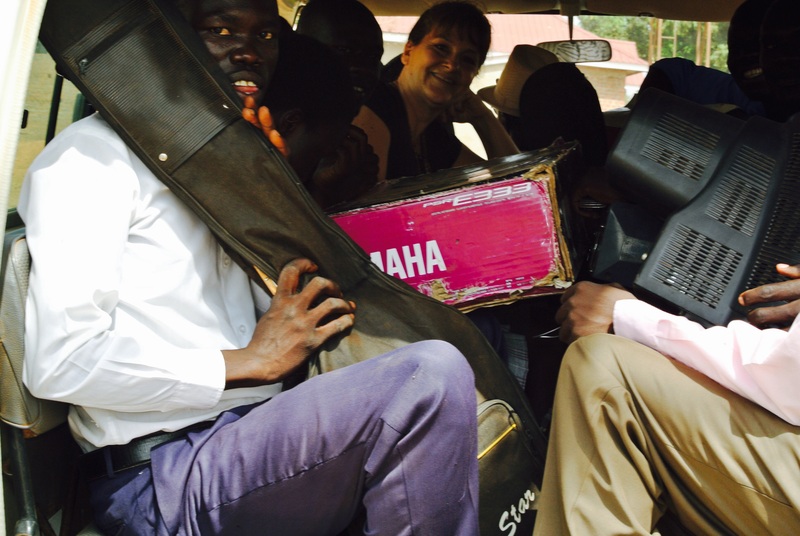 As a result of his radio outreach the Gospel is making headway in the West Nile region. We would love to see his influence spread by an increase in the power of his radio broadcast through more solar panels and battery storage capacity. Let us know if you have an interest in investing into that ministry. 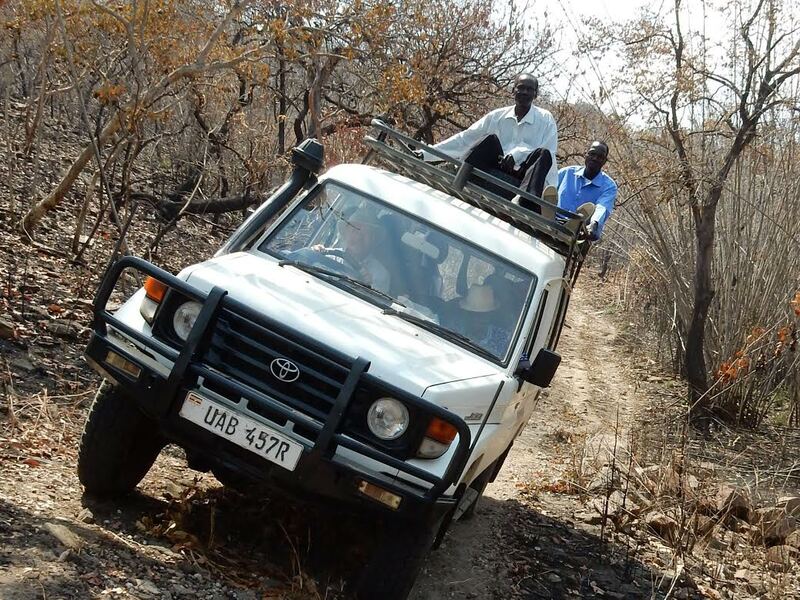 On Sunday, the 22nd, we set out early to Yumbe. 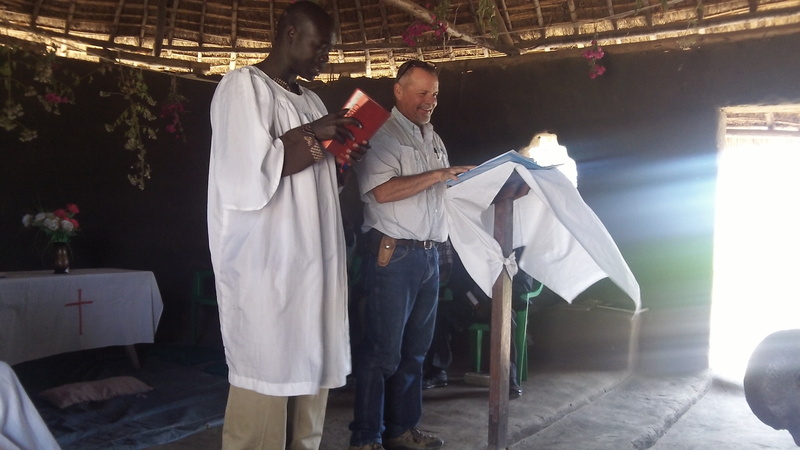 Jacob preached at Pilgrim’s C.O.U. 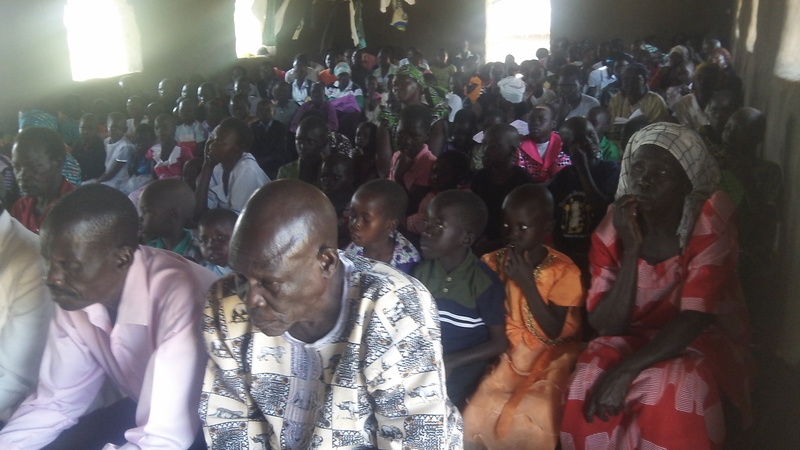 (Church of Uganda) on prayer in YUmbe town. 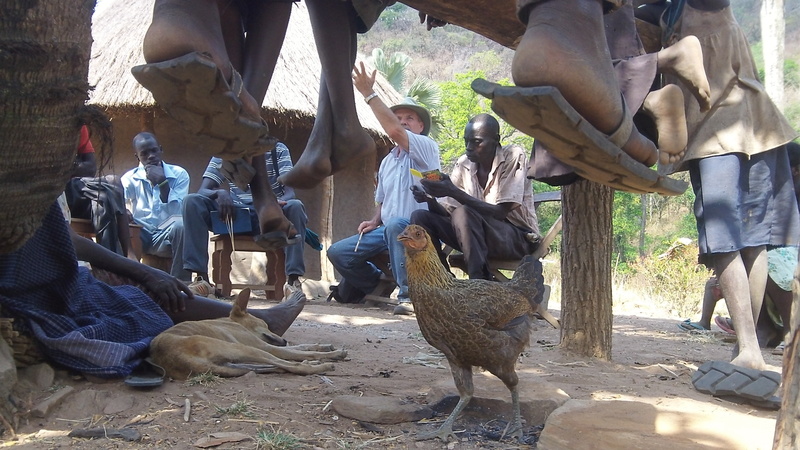 Charles, who pastors this flock, is starting a new series on prayer. Jacob preached on “The Persistent Widow.” This church is full of many young people! 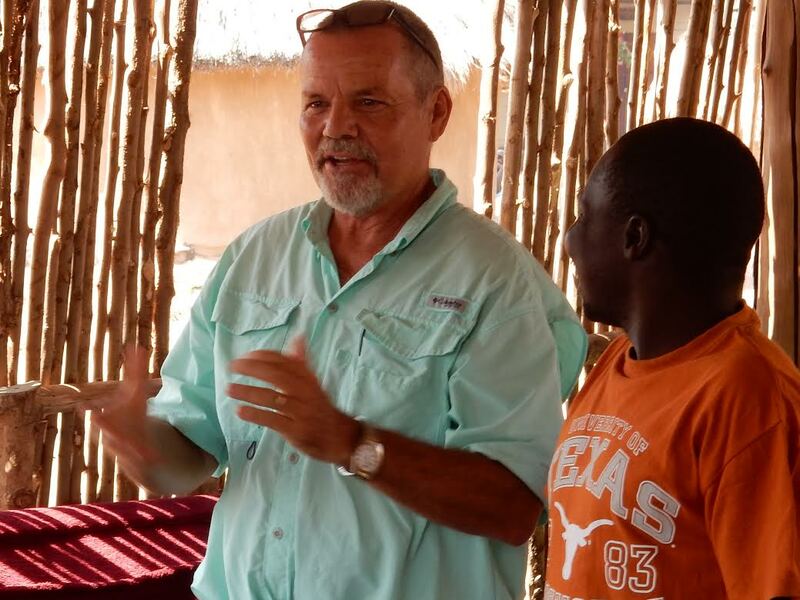 It gives us great hope that, under the wise and zealous leadership of Charles, this group of believers will have a profound effect on their town of Yumbe and the surrounding villages. 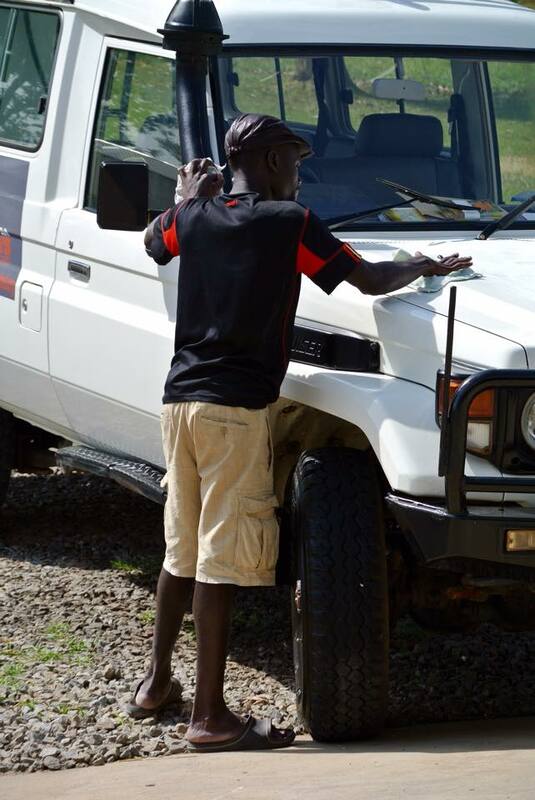 After a lunch break and short rest, some of the youth came back to load up the Land Cruiser with sound equipment and instruments…and many choir members! I just love how folks here make the absolute best use of every square inch of space! Every vehicle here is a HOV (high occupancy vehicle)! 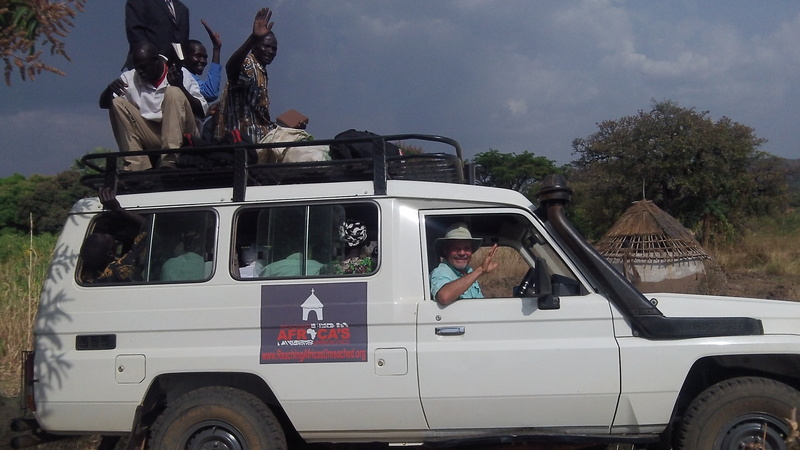 After loading, we made our way…slowly…to Kuru for Open Air preaching and person-to-person contact with tracts (John Piper’s “Quest For Joy” in English and Aringa as well as others in English.) 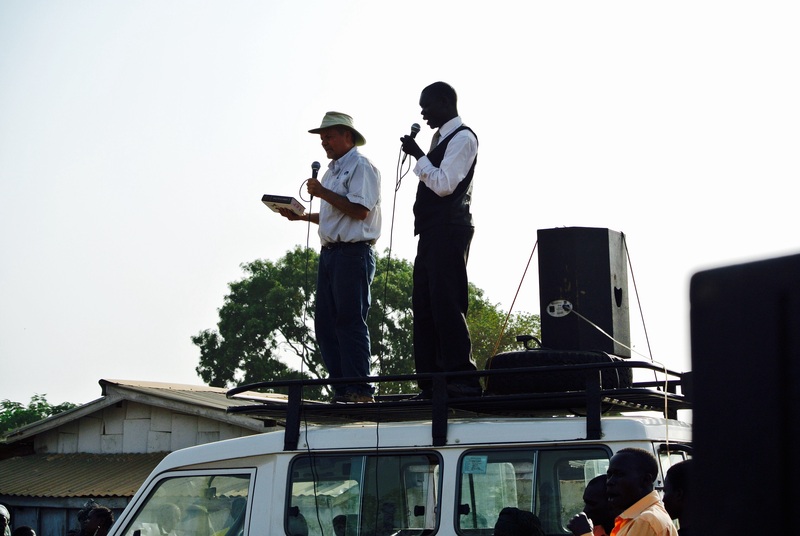 After some joyful singing by the choir, Jacob climbed atop the Land Cruiser with Charles where he preached his heart out. 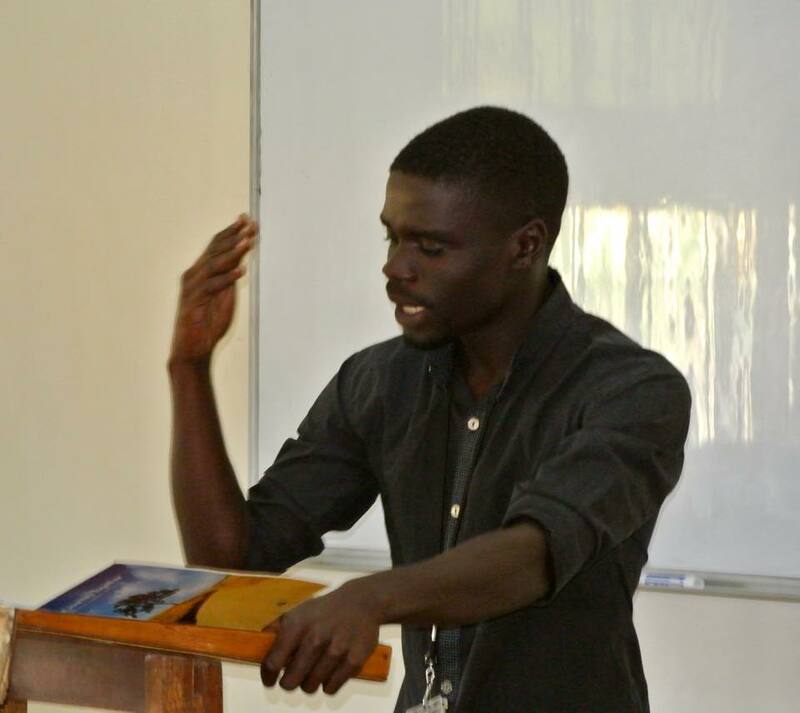 Charles is an animated and gifted interpreter and gave his best as well. We are sure that many heard the Good News. We pray that the seeds that were planted fell on good soil and will bear eternal fruit for the joy of the hearers and angels! Fully loaded! I really think there was room for one more thing…don’t you?!!! Telling the old, old story in a new way! The young lady seemed thoughtful and stayed the whole time. She was a serious listener. We pray she is a “Lydia”! 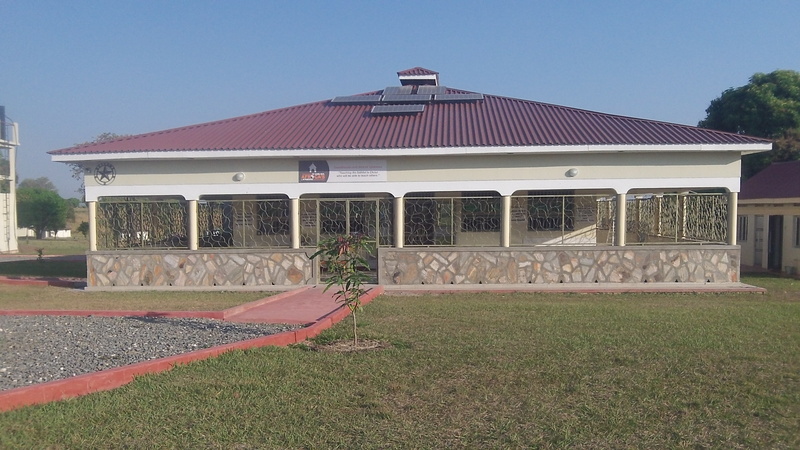 Right across from the area where we set up was the Yumbe District hospital. 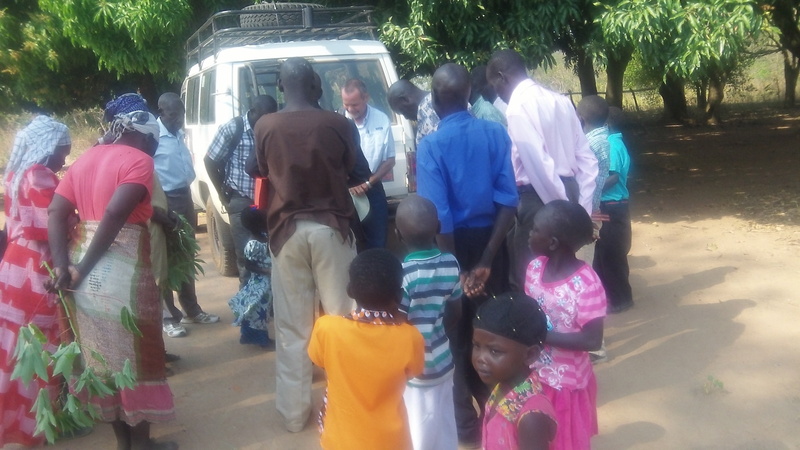 Jacob, Charles, Zorah and some of the members of Pilgrim’s went over to the hospital and were able to hand out tracts and pray with people. One experience, in particular, inspires hope and intercessory prayer. In one of our recent letters we wrote to you about a young girl who came to faith in Christ out of a Muslim family. She had received harsh physical and emotional treatment and even threats on her life from her family and even her mother. 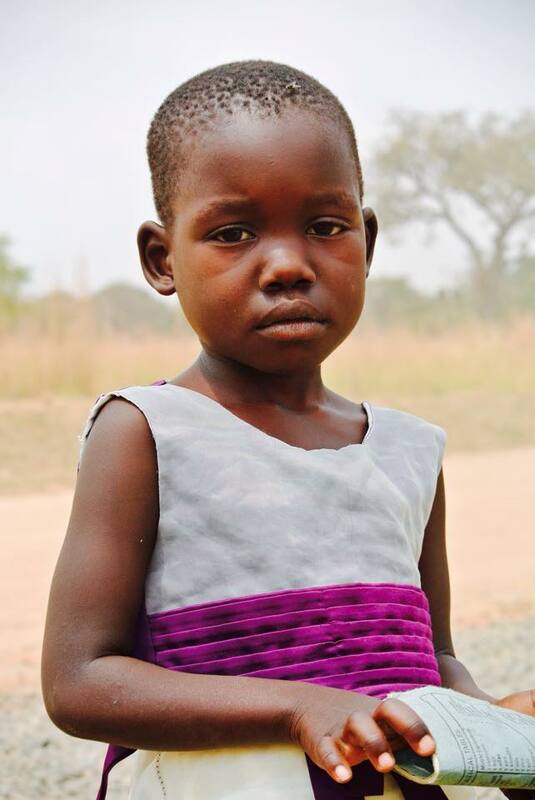 By the grace and heart-softening work of God, this young girl was released by her once-opposed family and was allowed to be sent to a Christian school in Arua where, we trust, she will receive an excellent education academically and spiritually. The first time we met the mother, her heart seemed hard and closed off to us. Then, this last weekend, we found out that this mother had another daughter who just miscarried twins and was in the very hospital that was across from our open air ministry. Jacob and Charles went to see the mother who was there caring for her daughter. Jacob offered comforting and empathizing words, even with tears (as he thought of his own grandchildren.) 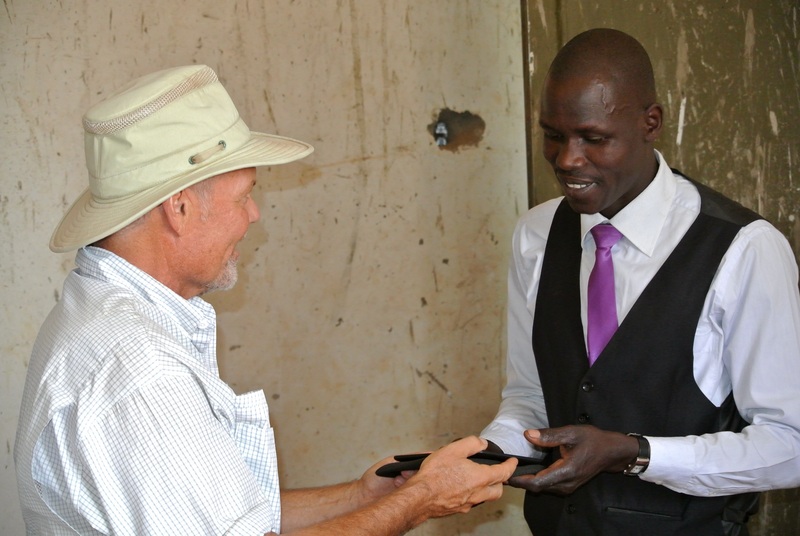 Charles and Jacob prayed for her and gave her a gift to help with expenses. This mother was moved visibly, expressing thanks for the compassion and care which she did not experience even from her own family. 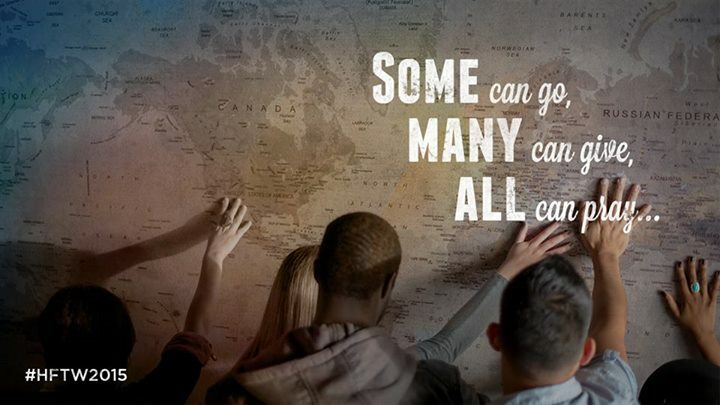 We are praying that the visible, tangible love of Christ will make an inroad to her heart where Gospel seeds have been planted and that this will bear fruit to salvation. The young girl we mentioned (that recently came to faith) is doing very well and overjoyed to have the opportunity to attend a school away from the harsh treatment she was receiving. We plan to visit her in March when the school has an official day of visitation. 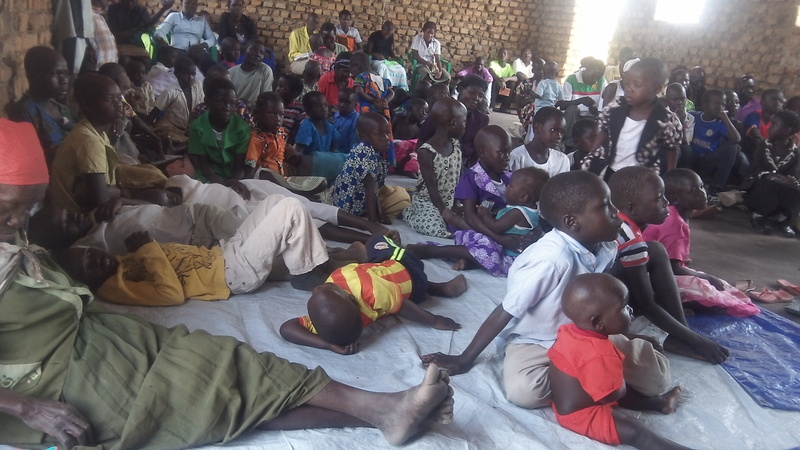 The eight children who were sponsored to attend First Presbyterian’s Primary school are doing very well, from what we hear. They have adjusted well and are studying hard! When we make our way to Kampala for our trip back to the States we hope to get some photos of these children so you can have more of a personal connection with them. 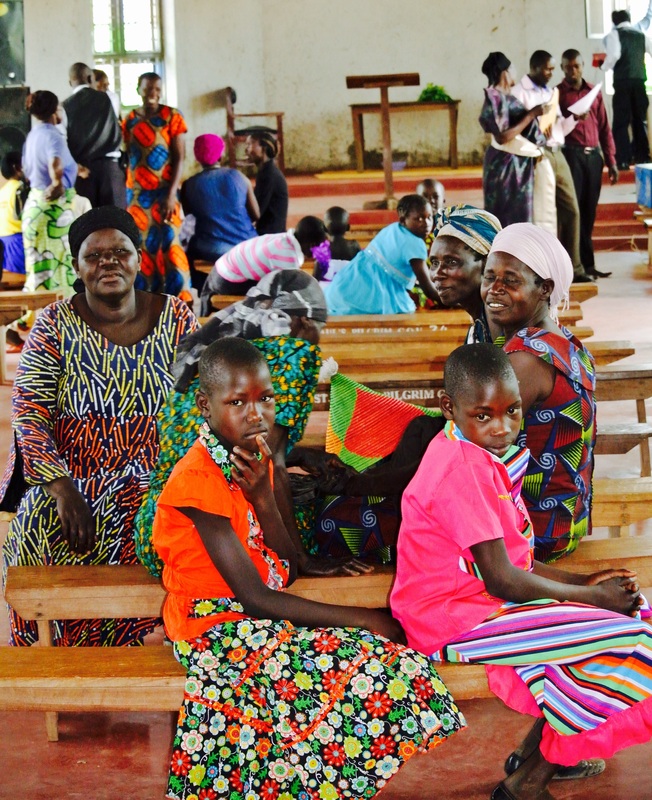 First Presbyterian Church, Kampala, where the 8 children are attending school. 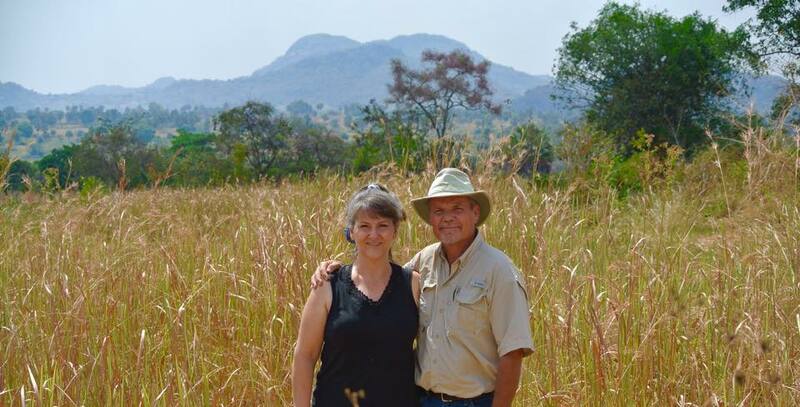 After a busy season of ministry, we have been so thankful for this week of slower pace – the opportunity to rest as well as take care of things here at home. Jacob pushes really hard. He, especially, has enjoyed the recuperation of slowing down for a bit. 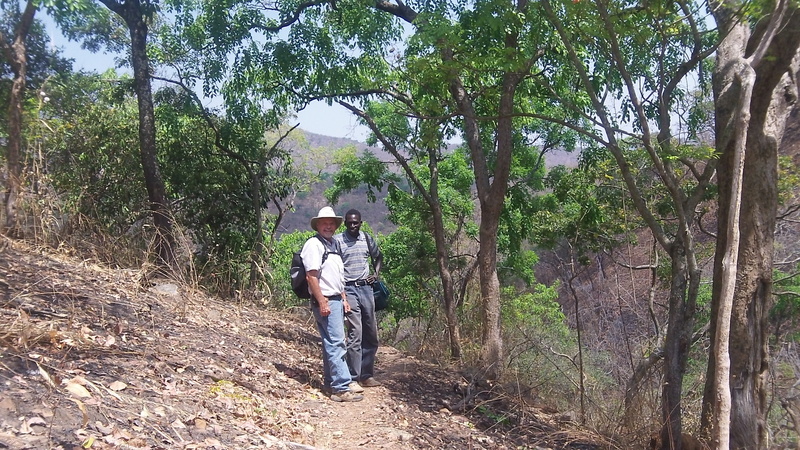 A timely rest it has been because this coming week will be another Pastors’ retreat – another group of men from the D.R. 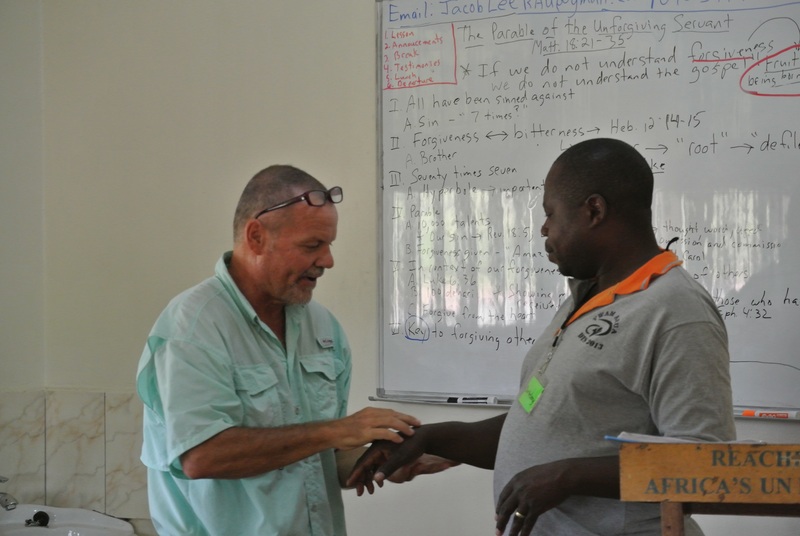 Congo for whom our friend, Joseph, has been the “point man.” The Lord is stretching our reach. 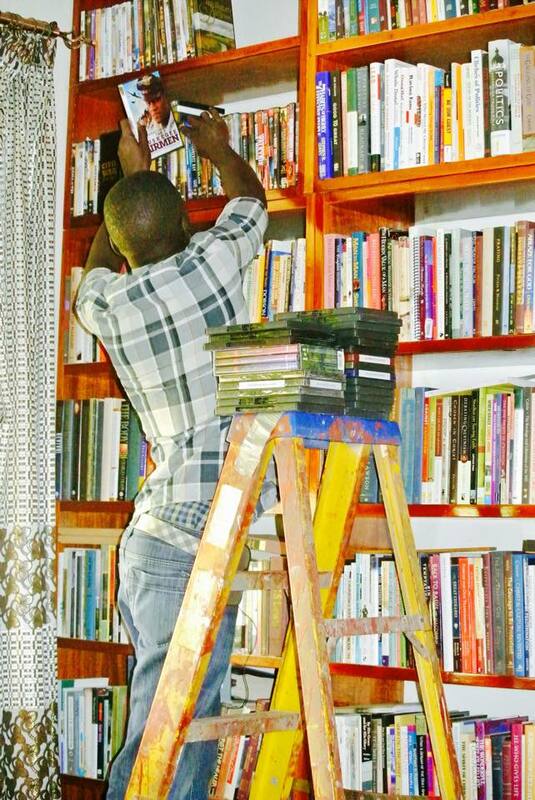 However, it makes us realize even more the need for resources that are either in Lingala or French. We need to find and include more of these resources in our next container. 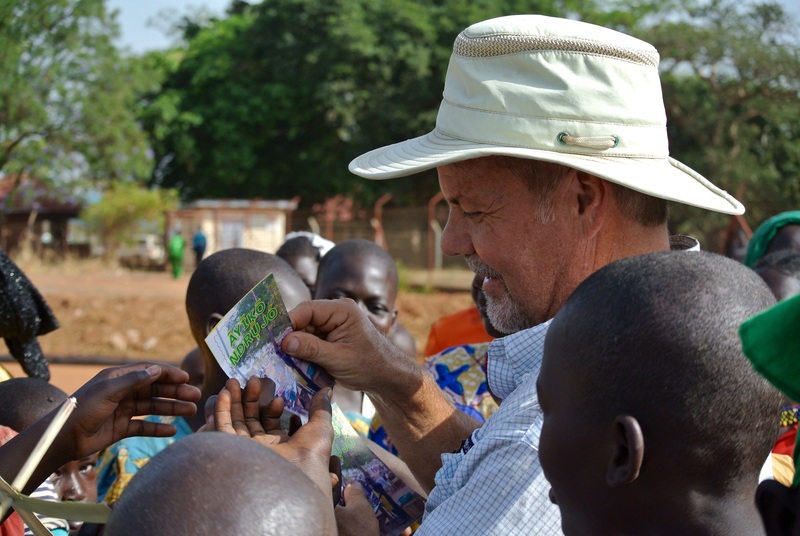 The “Quest For Joy” tract has now also been translated into Lugbara and Kakwa. Any help you can give to help publish and print thee tracts would be greatly appreciated. Please keep in mind the importance of the container and its priceless contents! 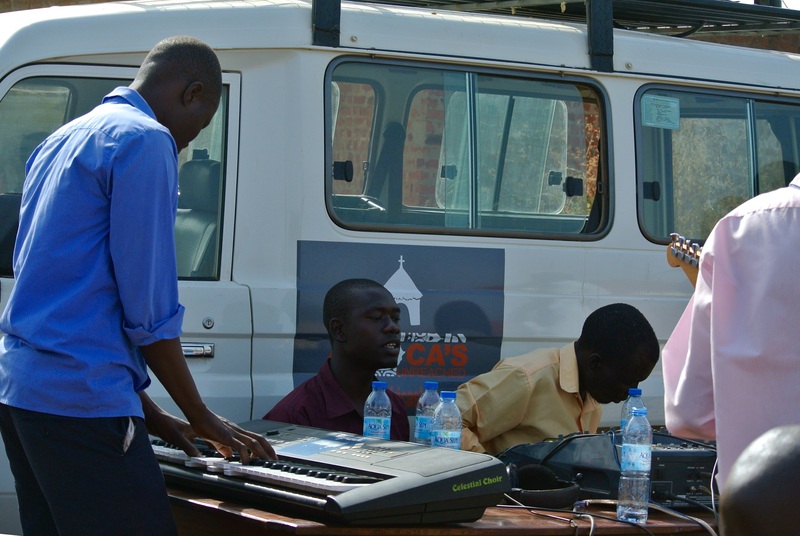 Our ability to provide resources is at the very center of our ministry. 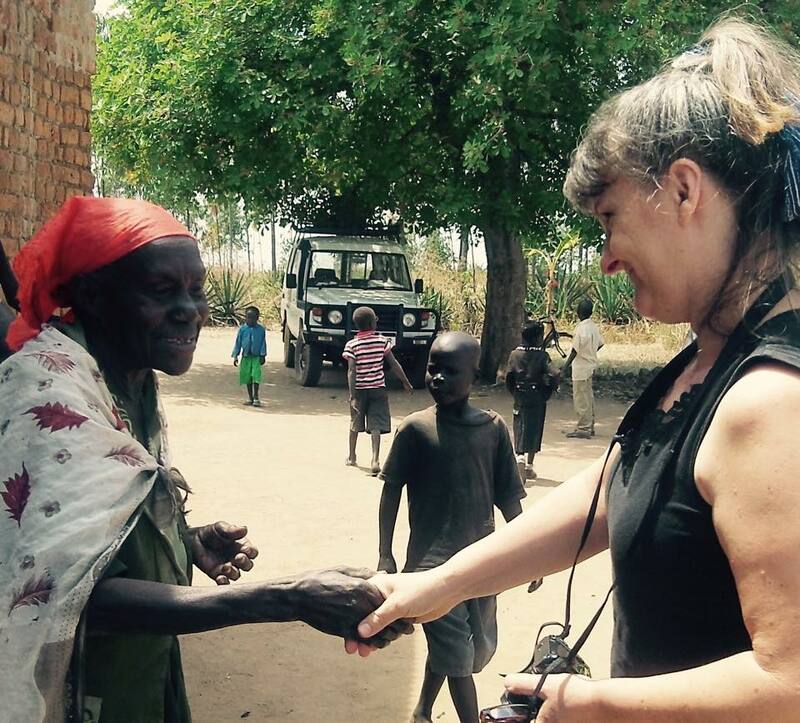 The resources we give out freely ensure an effectiveness that outlasts face-to-face encounters. 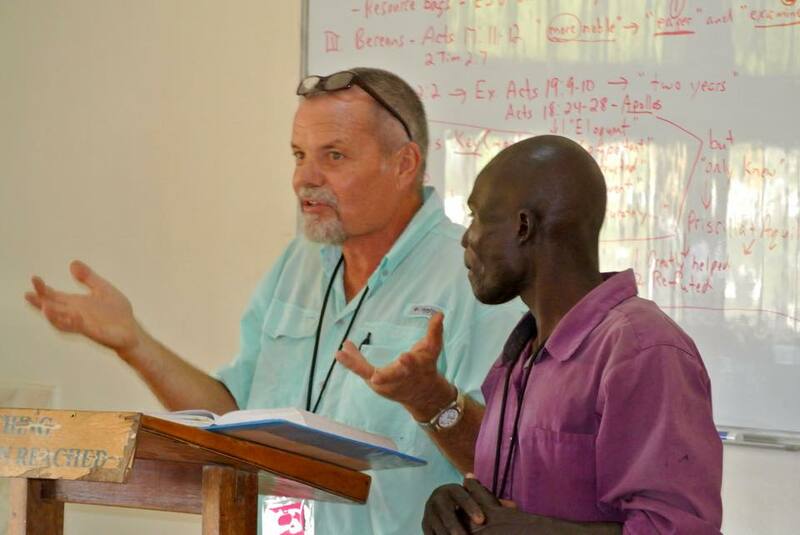 The need for more pastors for the new churches being planted and the many pleas of pastors for more in-depth training keeps our plan for a pastor’s college in the forefront of our vision. 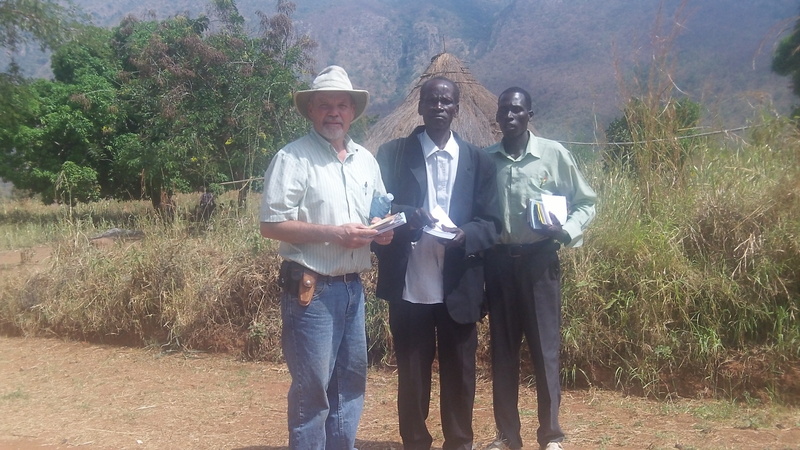 In Northwestern Uganda (West Nile Region) there are very few places where pastors can receive pastoral training. 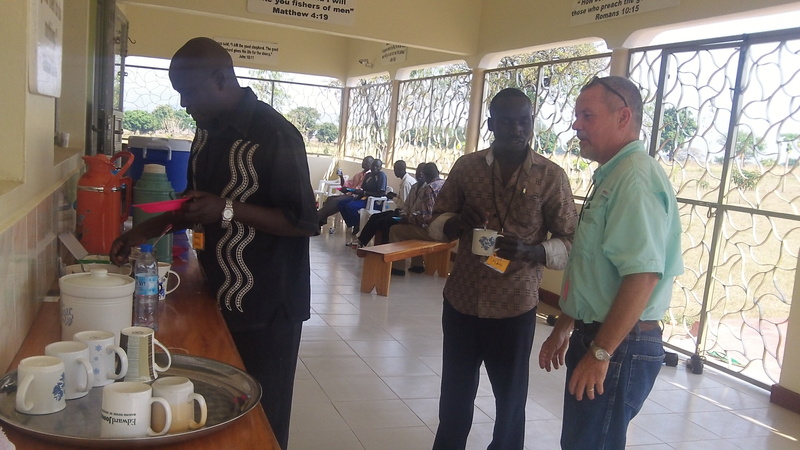 The Pastor’s college would not take the place of the retreats that RAU holds here – both have their place and benefit. 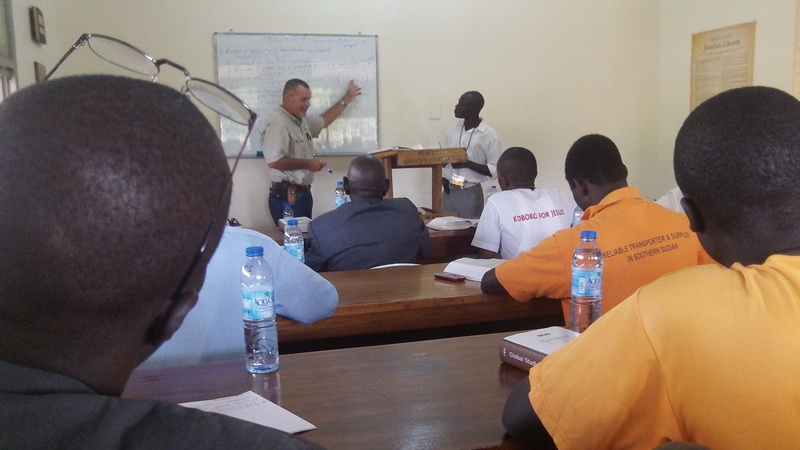 The Pastor’s College would hold several months of courses. It is not possible, generally, for folks to be away from their families for much longer than that. Jacob and I thank you for your never-flagging support, prayer, encouragement and love! May the Lord bless each one of you! “Puttin’ on the Ritz” for the wedding! That’s about as “Ritzy” as we get! This verse expresses the heart of this short note of thanks to those who have prayed for us and especially for those prayer requests in my last newsletter. 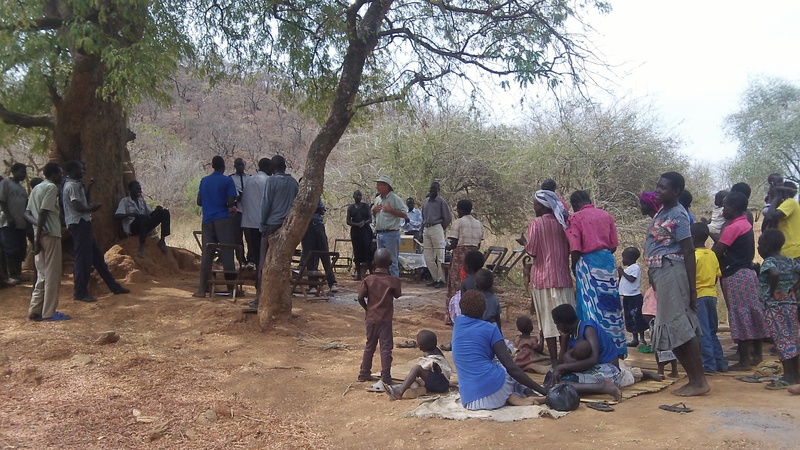 You can find the previous newsletter here: https://reachingafricasunreached.org/2015/02/09/revival-fires/. You need to know how the Lord has moved since last writing so you too can join in thanksgiving and praise to our heavenly Father! 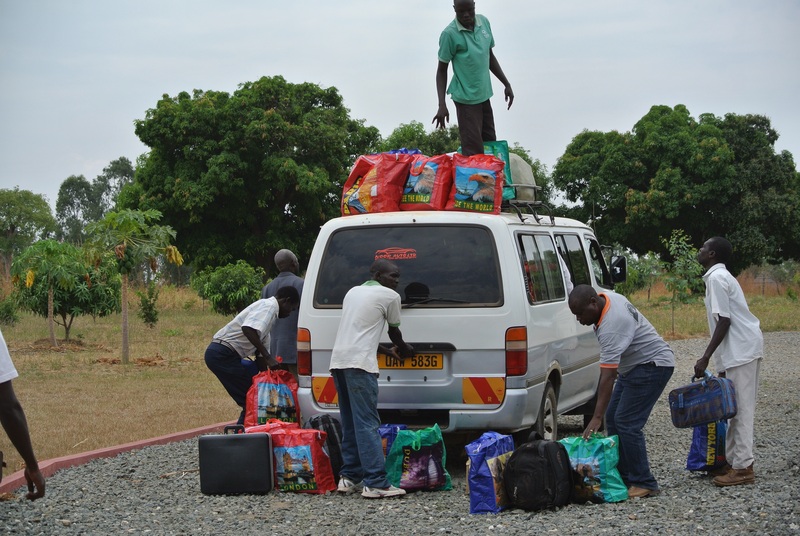 Because of sponsorship eight primary students from Moyo are now all settled in and have started school at Covenant Presbyterian School in Kampala. 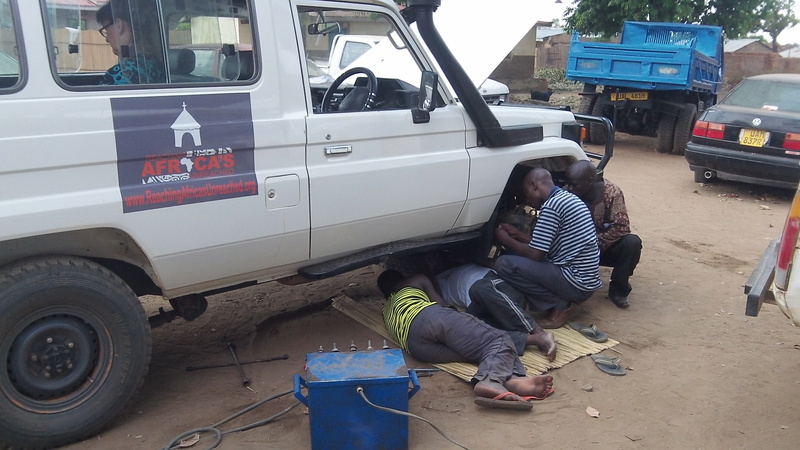 While in Arua I got some front end work done on the Land Cruiser. It has been taking quite a beating in our outreaches. 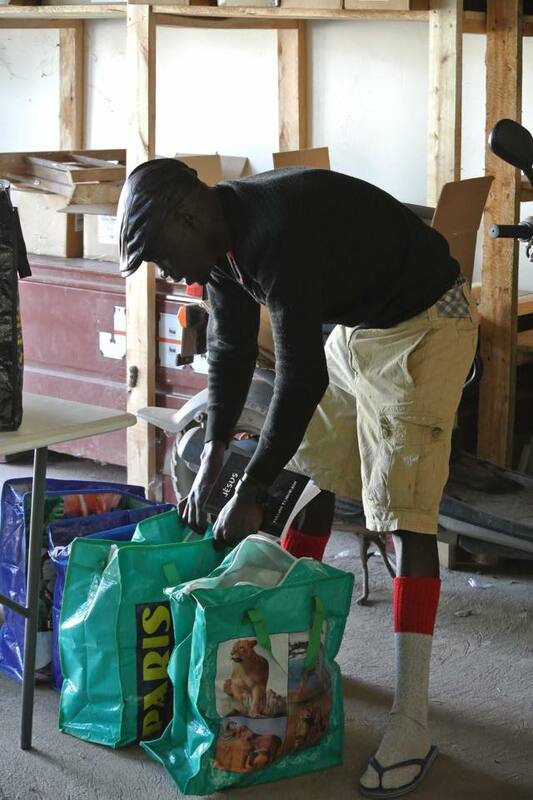 We also purchased bulk supplies of beans, rice, sugar, posho, and Royco (spices used in cooking), and traded an empty cooking gas tank for a full one. We have two upcoming pastor’s retreats and we go through a lot food. 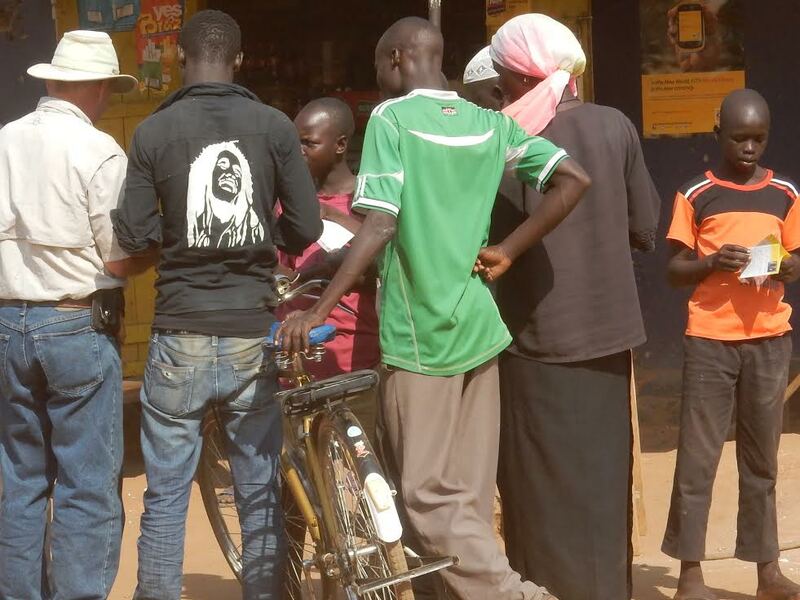 Buying in bulk in Arua saves us money. 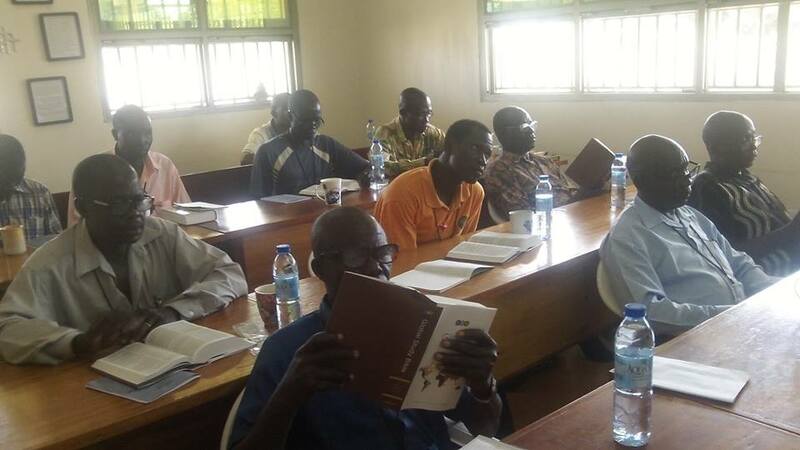 Please pray for the pastors from Congo and Arua who will be with us 17th – 20th and another group of Congo pastors March 3rd – 6th. 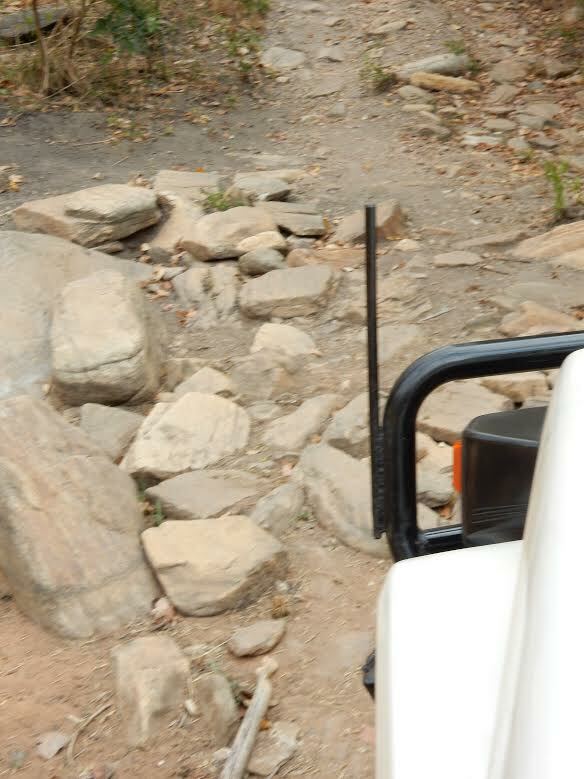 The roads, especially in the Metu Mountains, have been very hard on the Land Cruiser. Some money was given to help the local child who was brought here by her mother who had an umbilical hernia repair at age 3. 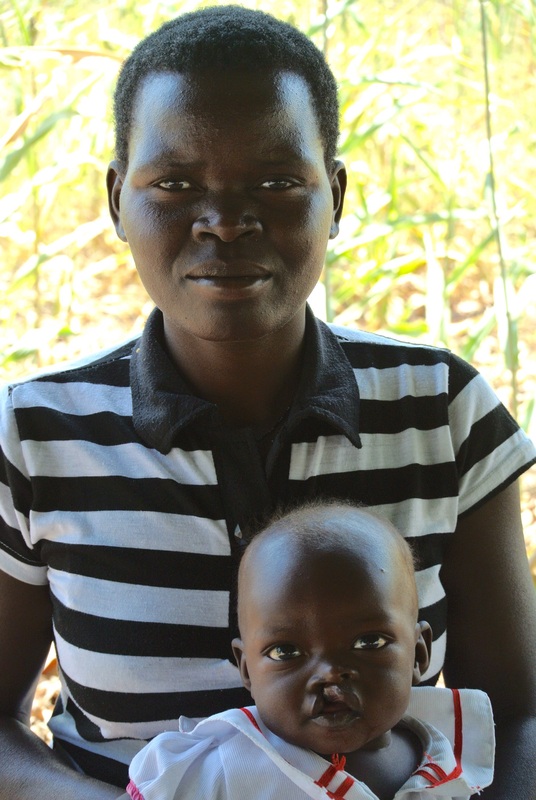 We will be sending her to Moyo hospital for an ultra sound and will seek a referral to Gulu’s Lachor Hospital, which specializes in children. Depending on what needs to be done, we will see if the donation will cover all the costs. Pray that it does! The day after writing the last newsletter we went back into the Metu Mountains for another evangelism outreach. The Metu Mountains (Southern Appalachian size) stretch on our east side. 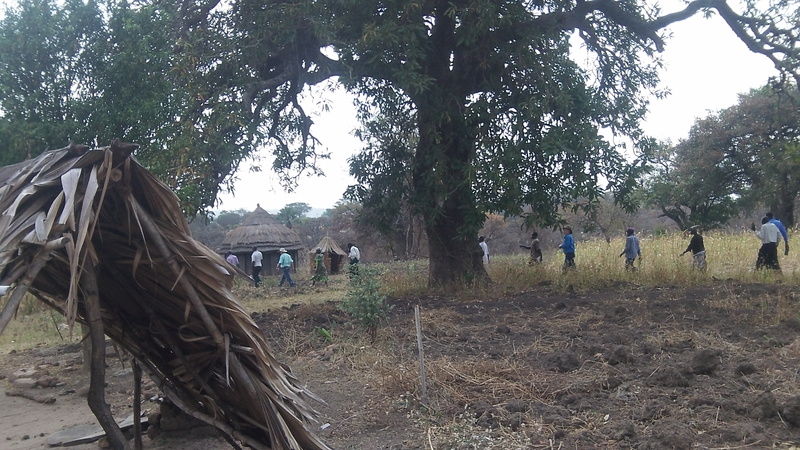 We went to Ayo, which was the last village among of string of villages we preached in (Gbarai to Arapi to Duku and Ayo.) 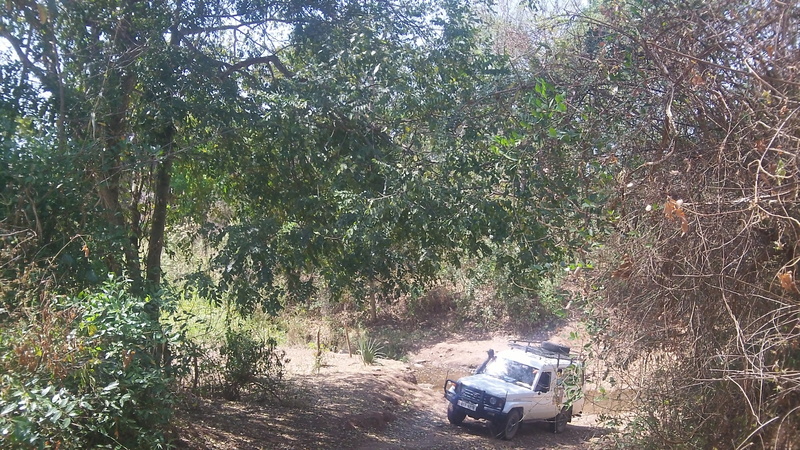 We drove as far as we could and then walked the rest of the way into Ayo. 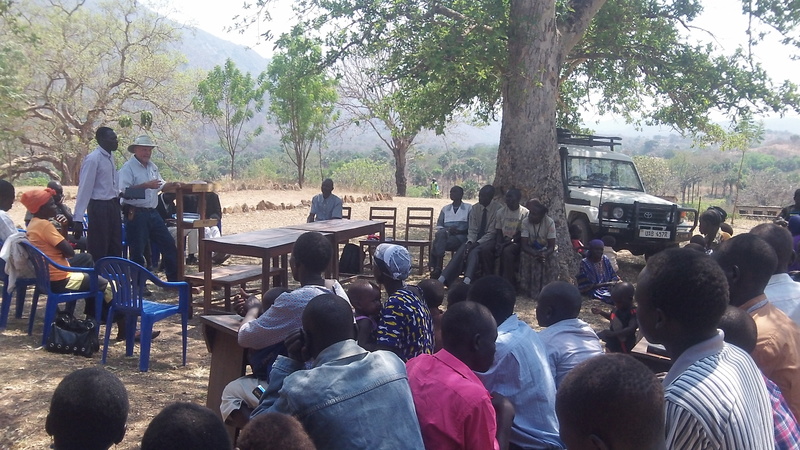 A little over 30 adults and many children gathered for the preaching of the Word. I preached my heart out and the Lord came down! At first it seemed that there would be no response to my exhortations/pleading with them; then, one older lady stood and as soon as she did 19 other adults stood to make open professions to follow Jesus. Our hearts leapt with joy along with the angels (Luke 15:10). 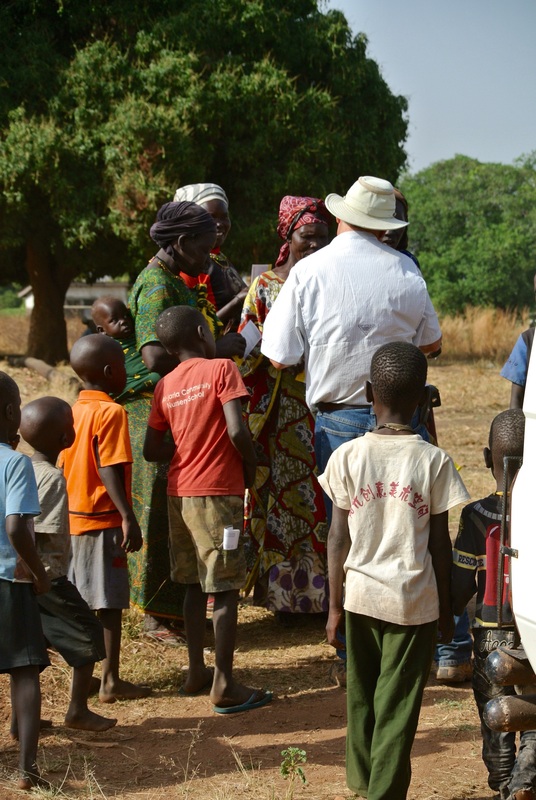 After sharing more and getting names, we, along with the local clinic nurse (she also confessed Christ in Ayo), gave out many medicines which RAU brought along. Upon leaving we were told that a woman who could not make the walk (because of being burned badly as child) wanted salvation. We walked down to the stream and met her. 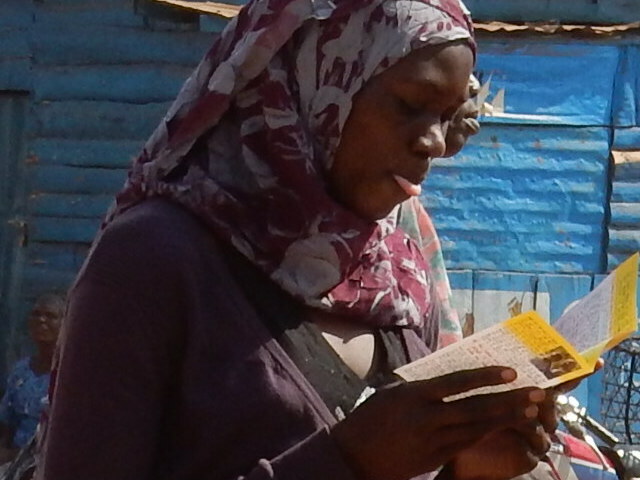 Geoffrey shared the gospel and she immediately believed! Thank you for your prayers! 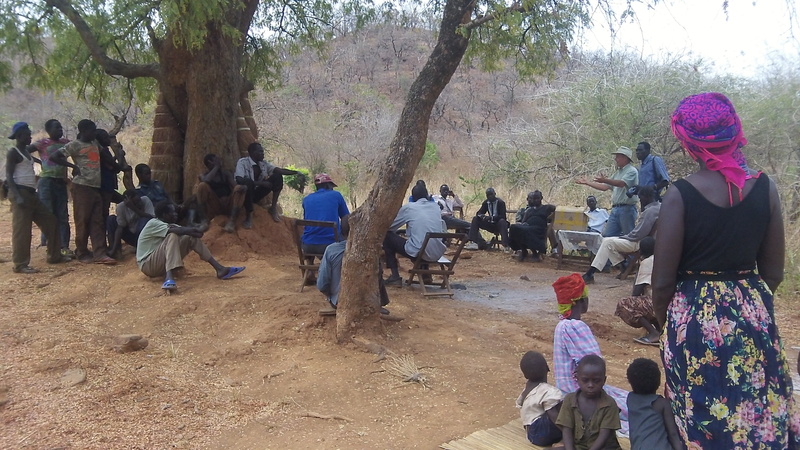 Pray now that we can work out strategies for discipleship and the planting of a church there. It is too far of a walk to Gbari. There is one more village beyond Lea in a nearby string of hills that we know of which still needs to be reached. Plans are set in motion to go there soon. Keep praying. God is hearing your prayers! Those standing are the ones who are saying “I trust in Jesus for salvation and want to follow Him”! 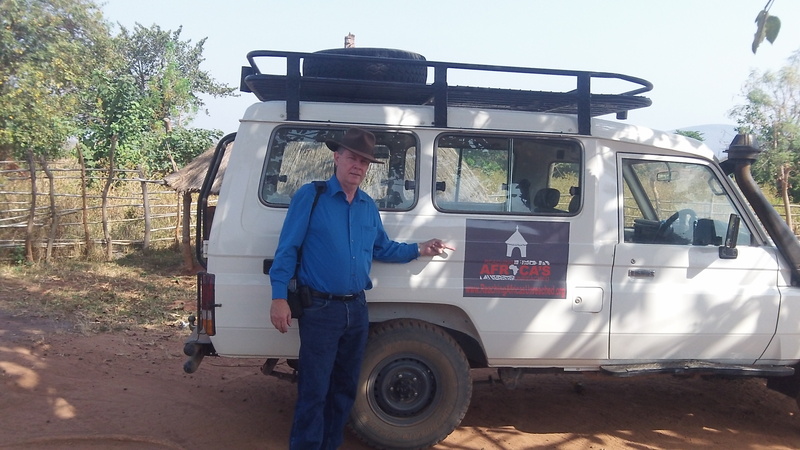 Tomorrow I am preaching at Laropi Baptist Town Church and next Sunday, the 22nd, in Pilgrim Church of Uganda in Yumbe Town. 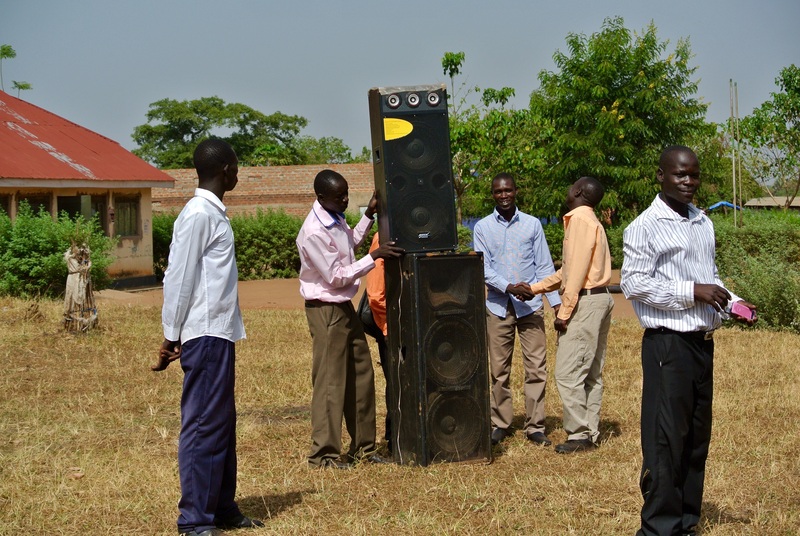 Later in the day we will have open air preaching (following the example of George Whitefield) in Kuru market. 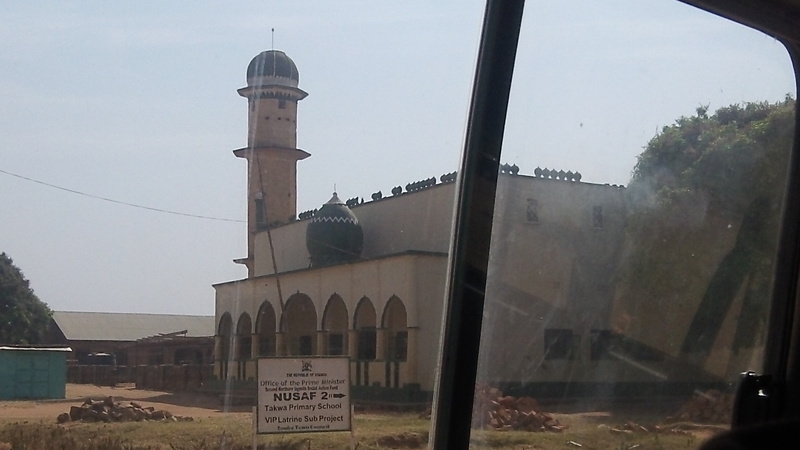 Kuru is just outside of Yumbe and is considered by the Christians in Yumbe (that I have talked with) to have the most ardent Muslims in Yumbe District. 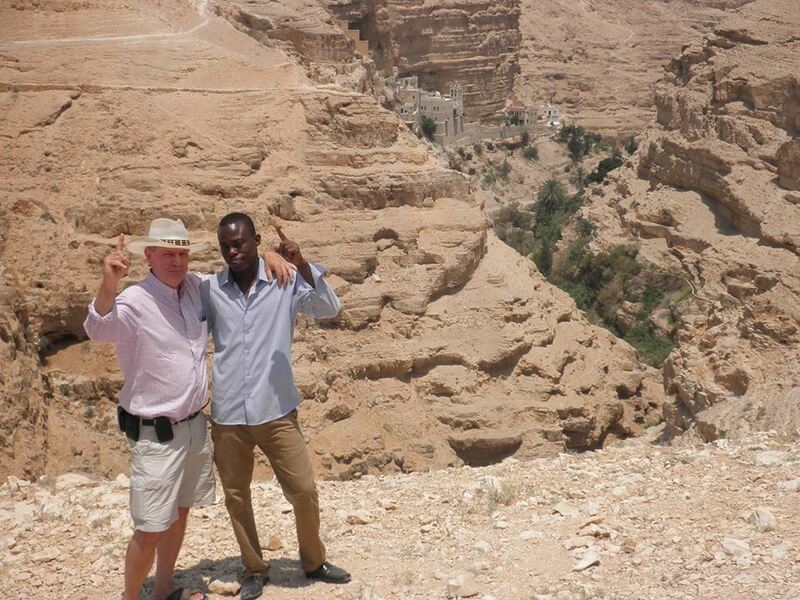 It was confirmed to me by two Christian “men of the soil” that 95% of the people of Kuru are Muslims. 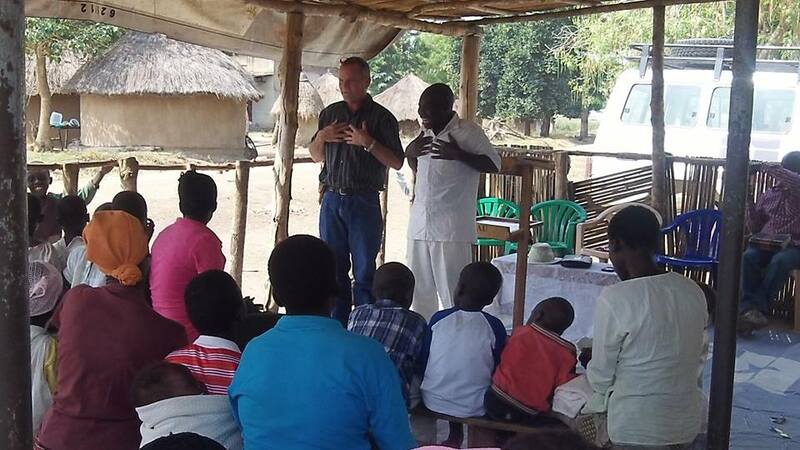 I am asking/imploring you all to pray daily and fervently that the gospel would make inroads into the hearts of the people in Kuru. 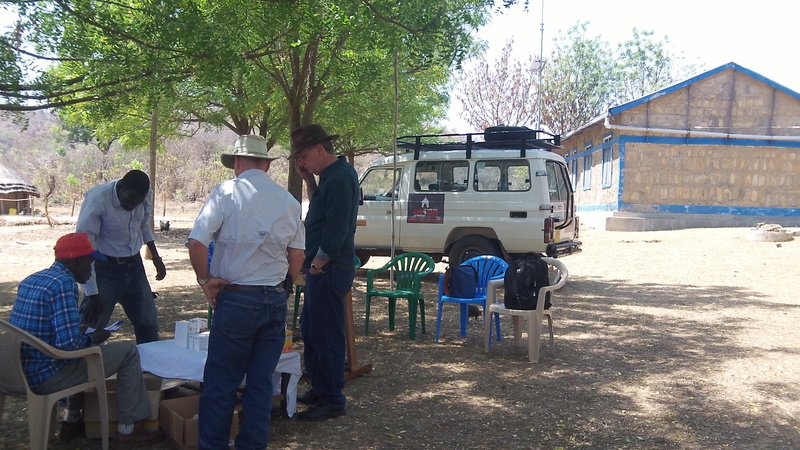 We have already been in Kuru on several occasions for one on one witnessing and handing out tracts in Aringa. Thank you for all your prayers and support. Carol and I appreciate them and you. May the Lord richly bless you! Even though it has been a while since I have written, you have been never far from my mind. 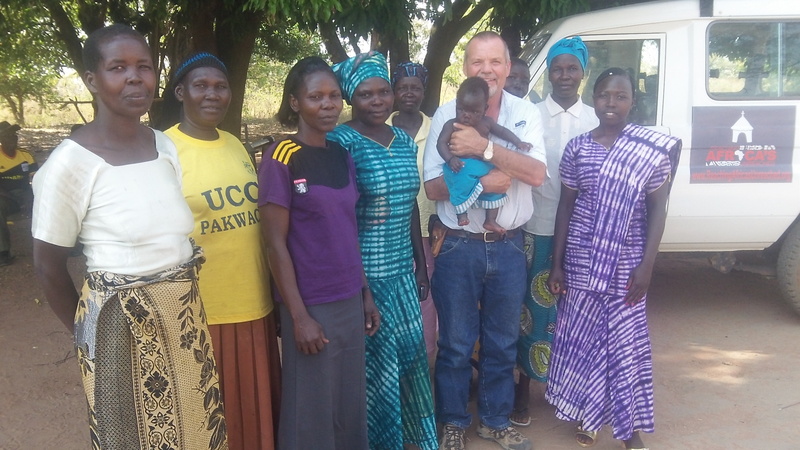 I am continually reminded, as I see grace and mercy working effectually in people’s lives here as well as in our own, that your prayers and support are the means of supplying that mercy and grace here in the West Nile. Seeing such an outpouring spurs me on to further action. Puritan Thomas Brooks puts it this way, “A man full of hope will be full of action.” Carol and I have this hope because of our Lord and His promises. We also have hope because of so many faithful friends! Thank you for your effectual partnership. Come and see now what the Lord is doing! I truly feel that the Lord is fanning a fire of revival, especially on Metu Mountain. 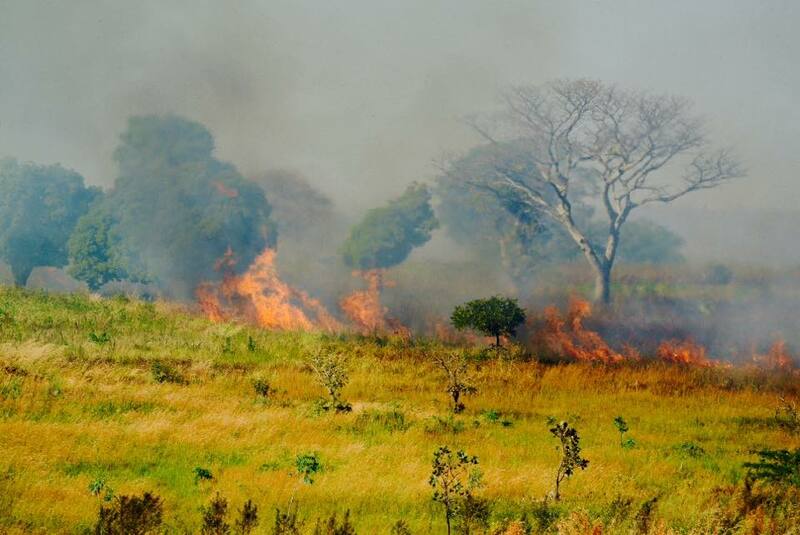 The physical fires that rage during the hot season all over the mountains, which we saw with our own eyes not long ago, are almost representative of what is happening spiritually there! 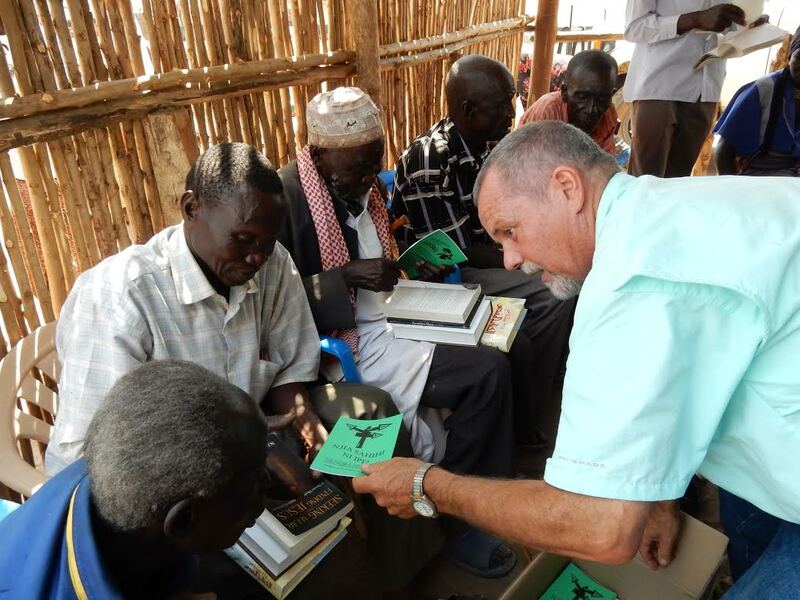 We have been blessed to “catch the wind from Heaven” and to come alongside the churches that are reaching out with the gospel in the remote villages of Metu Mountain. If you click on “Like” you will receive a notice each time I place a short post or picture. 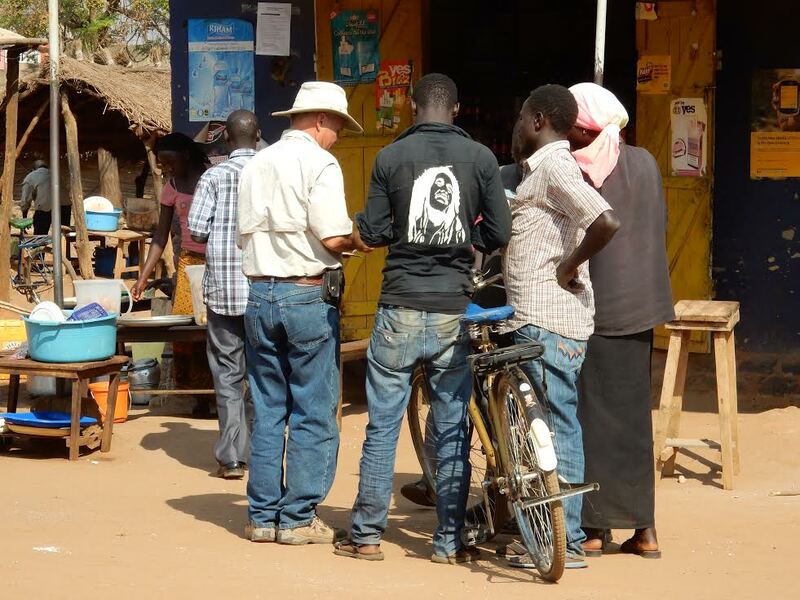 Every village must be reached with the gospel. Where there are no roads we walk! Working together to spread the fame of King Jesus! 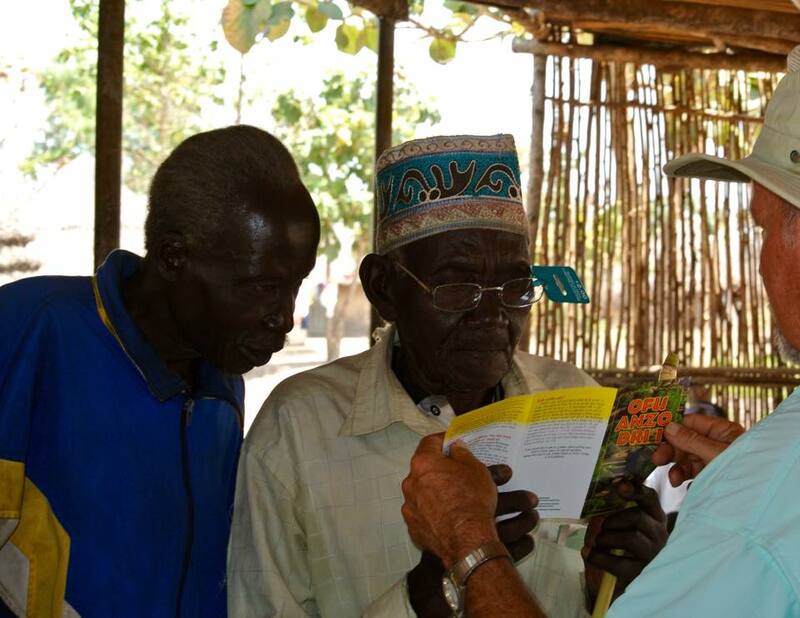 Every village MUST be reached with the gospel! While John Howarton was here we also went to Obongi on Sunday Feb. 1st. 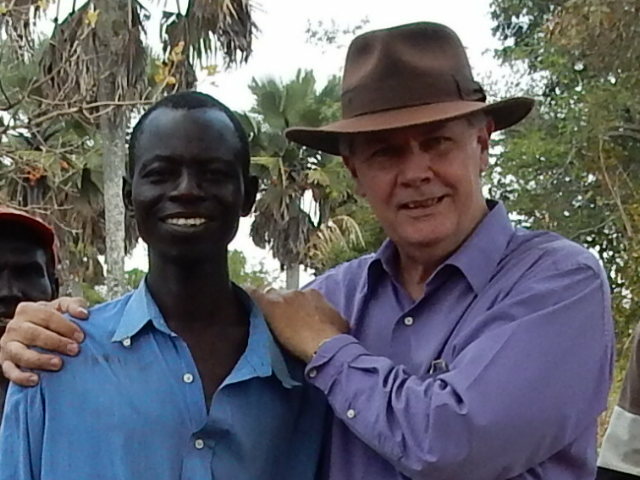 It is always a joy to stand with Godfrey and to encourage him in his every effort to shepherd his flock well and to enlarge the flock through loving evangelism to those around him. 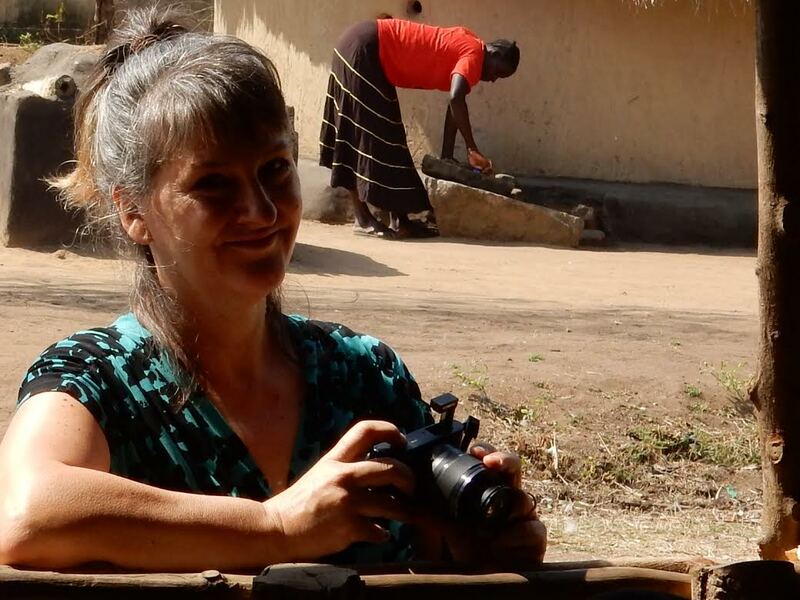 Carol capturing the beautiful people of Obongi and Africa with her camera. With one of the Imams. Pray for these Imams and all the Muslims who attended the church service. 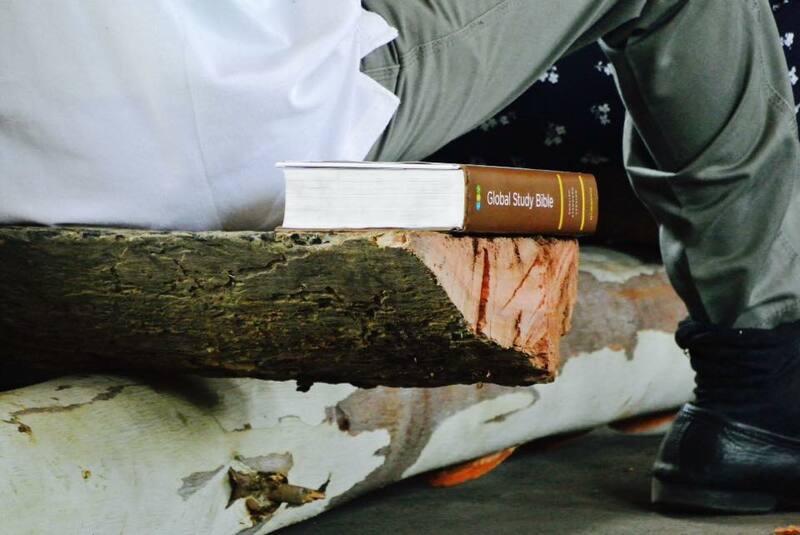 I can read…and it is the gospel! 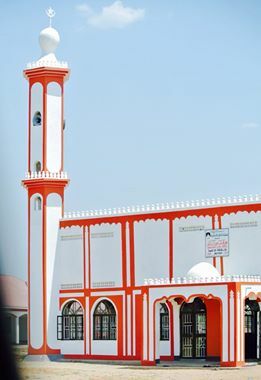 The largest Mosque in Obongi. The Imam was with us all morning! Lord, open their eyes to see and believe the glorious gospel! 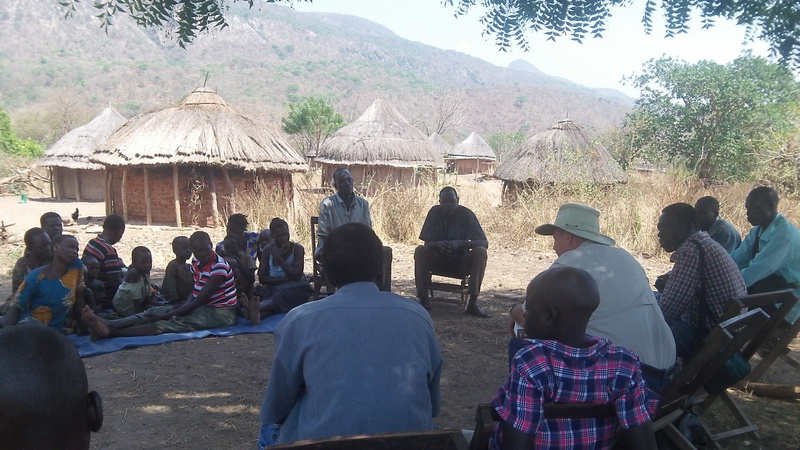 The day after John left we received 15 pastors and church leaders from the Maracha and Koboko areas which are situated close to the D.R. 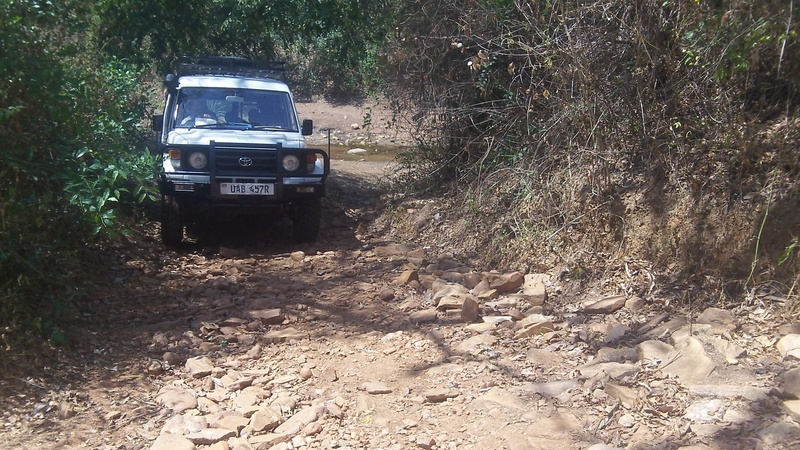 of Congo as well as South Sudan. 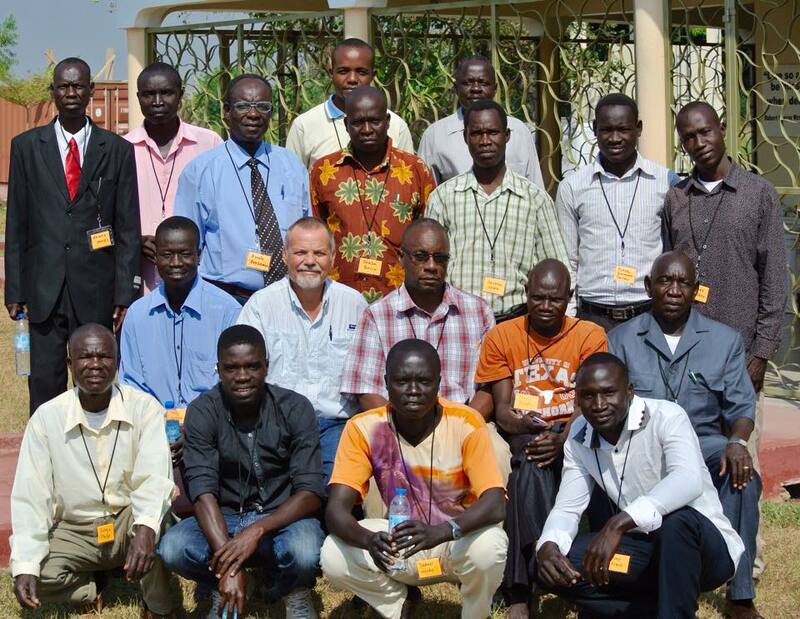 It was a great group of men which our friend, Joseph, organized and brought. 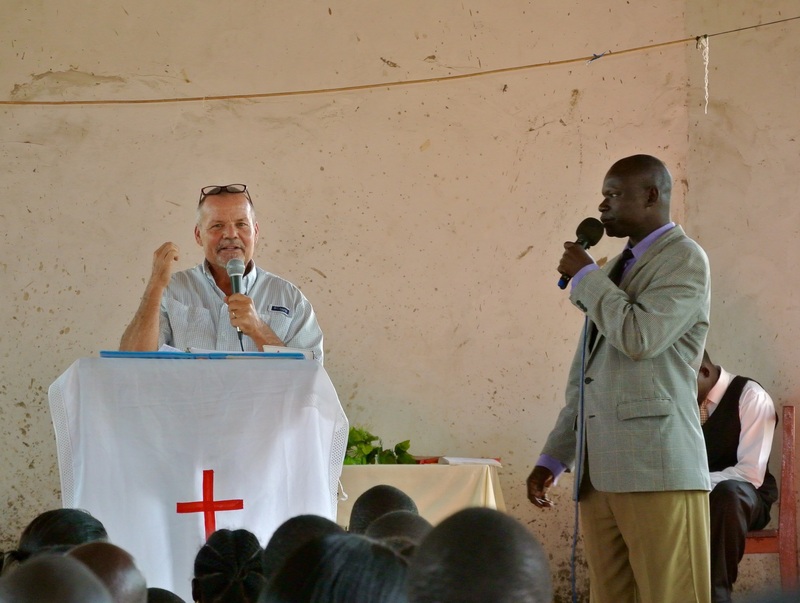 Our friend, Pastor Bob Gad, from Kampala came and helped me with the teaching. 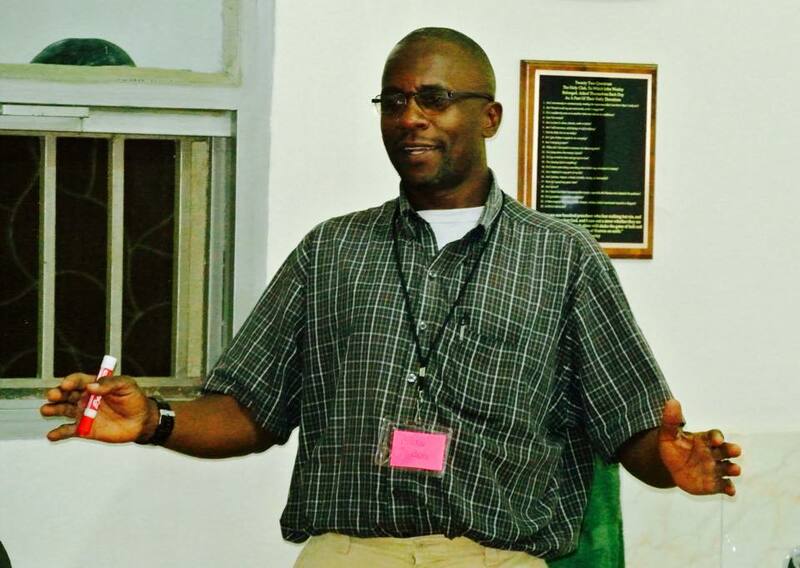 He is a gifted teacher and really has a heart to help other pastors grow and be encouraged in their faith. Also, RAU intern Achidrii Onet Zorah taught a session. 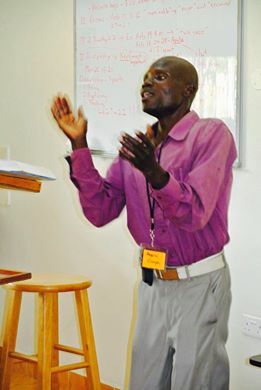 Zorah received his biblical training in Kampala and is originally from the West Nile (our Northwestern area of Uganda). He has a real heart of a servant and has been a great aid to me. He is helping to fill in the gap since co-worker Sam left to upgrade his medical training. The Facebook posts continue below. We have another group of pastors with us this week for a retreat. They should be here in a couple hours. 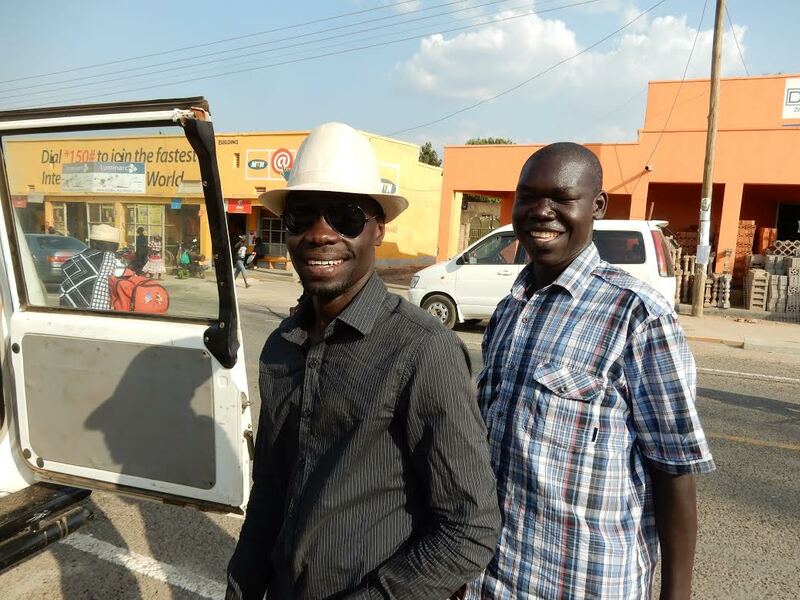 The leaders are coming from Koboko and Maracha. 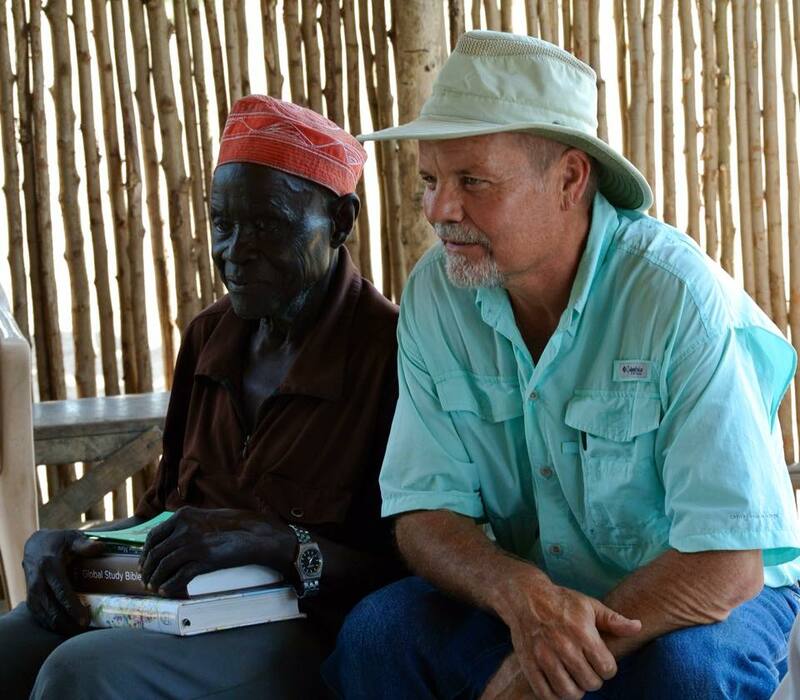 Please pray that the Lord would strengthen and encourage these shepherds! We are about to start day three of our 11th pastor’s retreat. 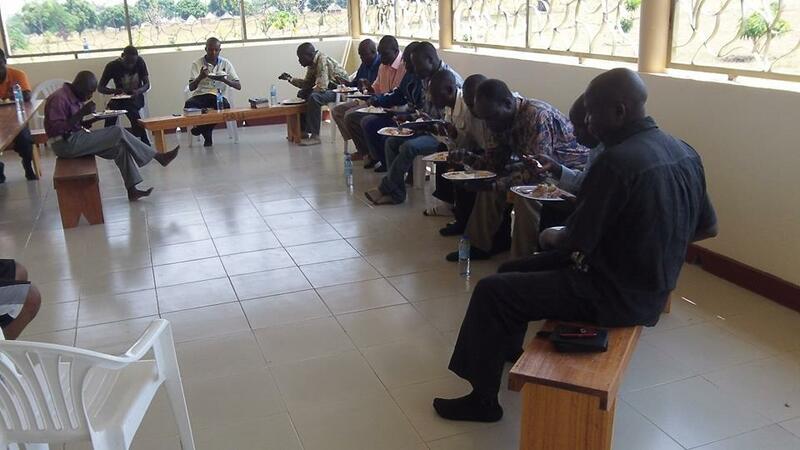 Most of these pastors are from Koboko along with a few from Maracha. Bob and I have been doing the teaching. Zorah will jump in the line up this morning. It is such an honor to have a part of shepherd’s lives that are on the front lines. 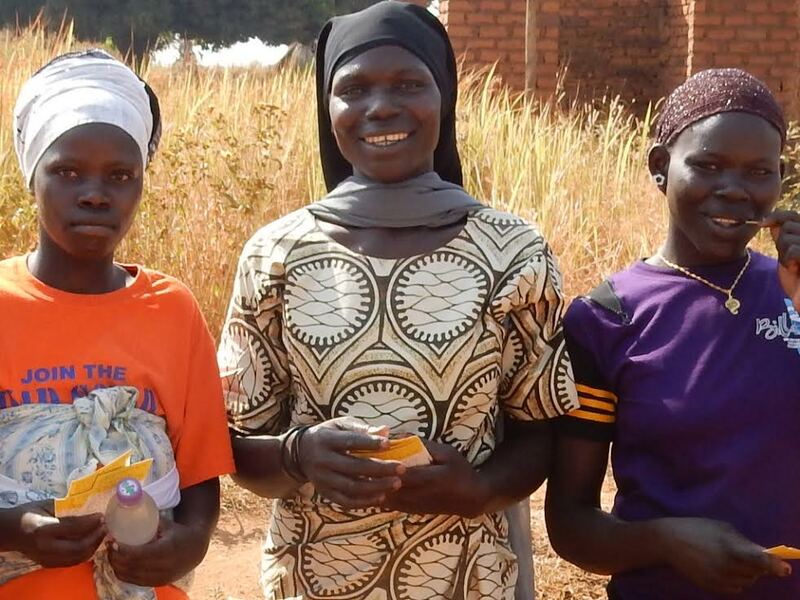 May the Lord use our time together and the materials they are receiving to encourage and empower them for their flocks and the multiplication of their congregations in village which do not have a single church! This retreat was our 11th one since Carol and I made our permanent move here. 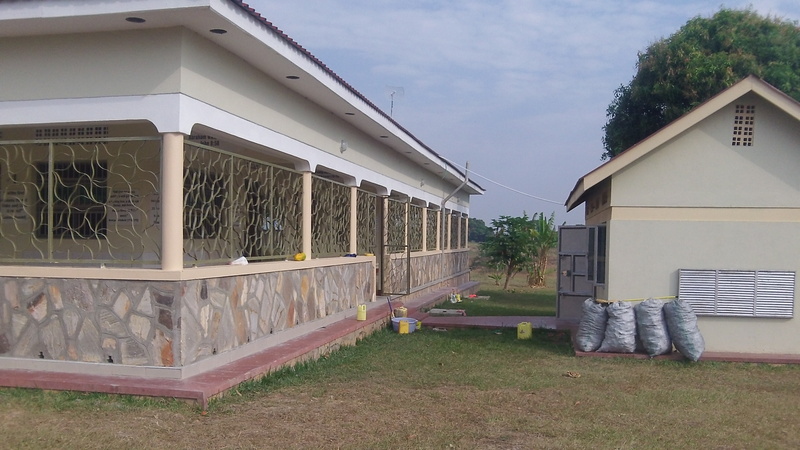 We are currently adding a large room to “Sam’s tukalu” which has an attached bathroom and is near the Guesthouse. 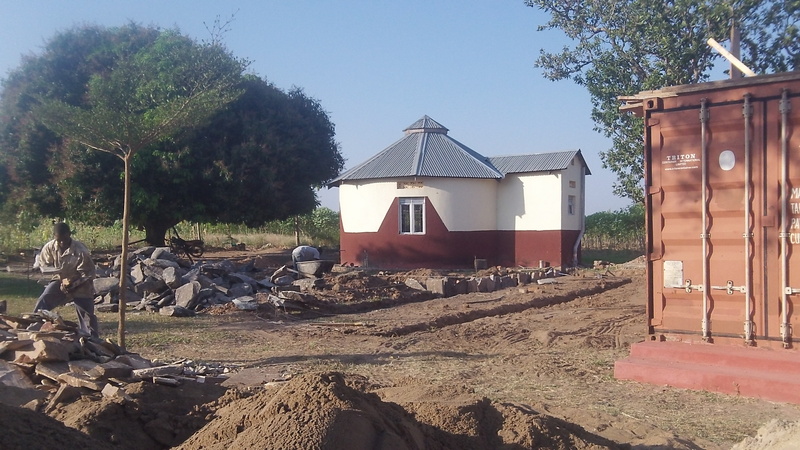 This addition will allow us to sleep 8 more church leaders for retreats. We also will have a double bed in the room for any married couples from America which would like to come for short term ministry. As I have mentioned in past letters these retreats are the top priority of RAU’s calling. 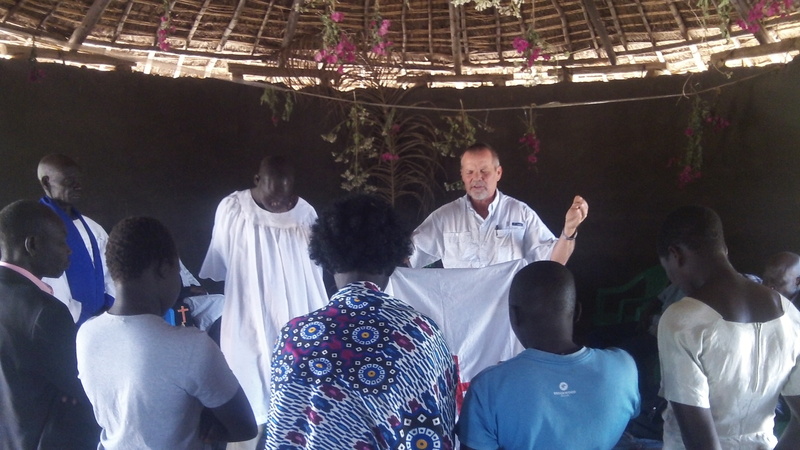 In these retreats we are able to interact closely with church leaders to strengthen and encourage them through the teaching and resources. 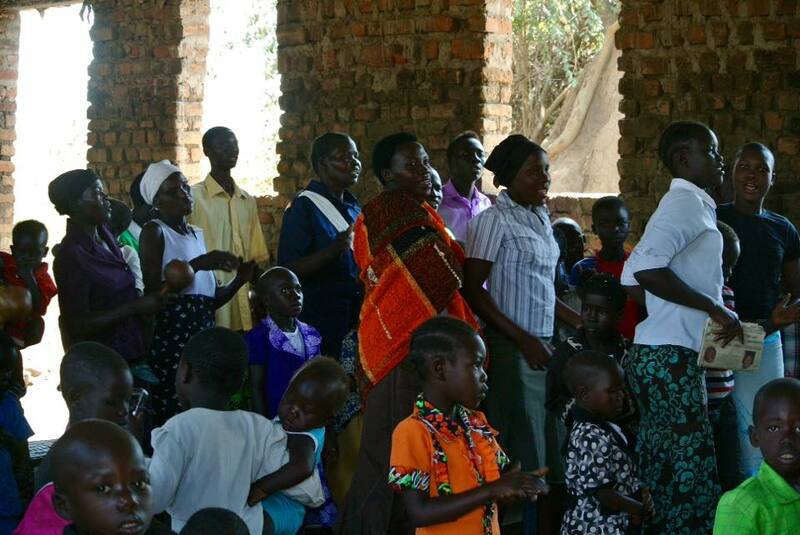 Our goal is to better equip them so that they can strengthen their congregations and so that they can be multiplying congregations. 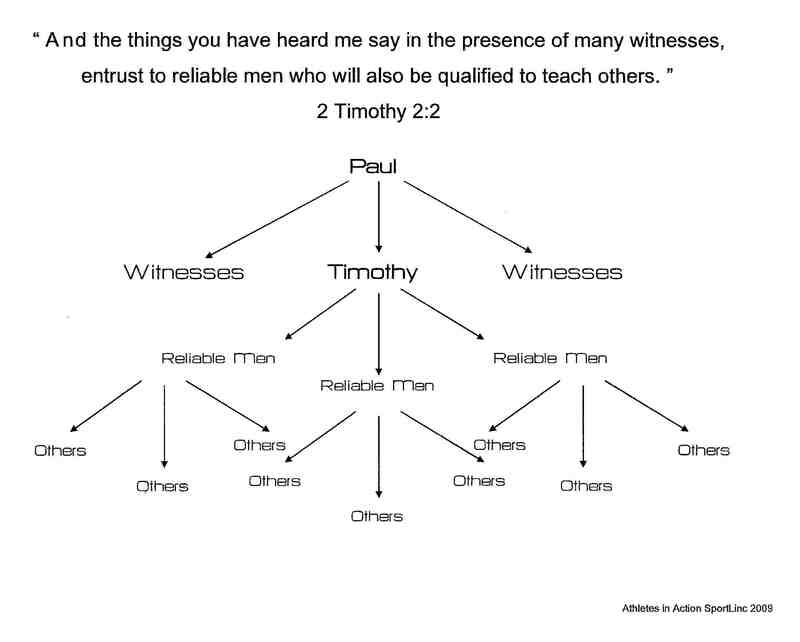 2 Timothy 2:2, with the biblical examples of Acts 19:9-10 (“…so that all…”) and 18:24:24-28 (“…took him aside….”) are our theme verses for the retreats. Your prayers and support help us transport leaders here and back and care for them while they are here. We have other retreats scheduled and we are planning for more. We are back and had a blessed time with the Katrini believers. 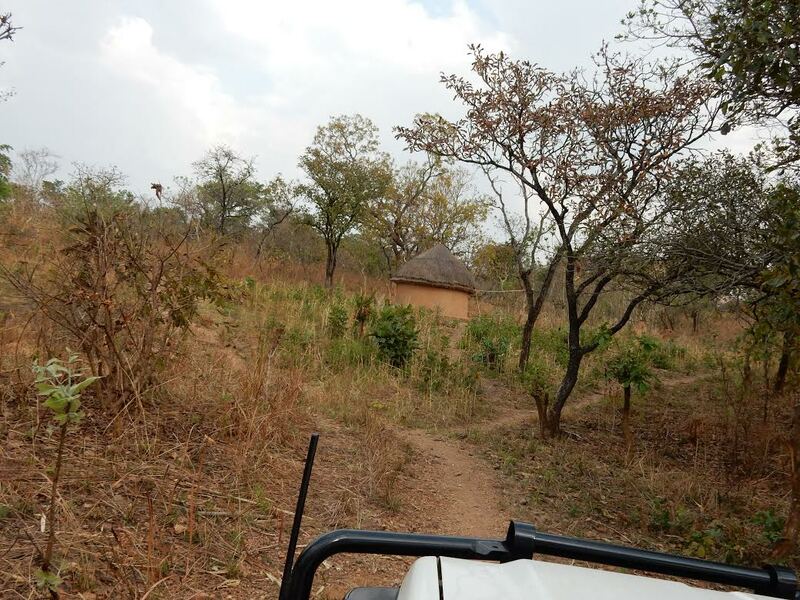 (Katrini is located in Yumbe District not far from the Koboko District). Their love for Jesus shines brightly! What an honor to proclaim the Word to them. 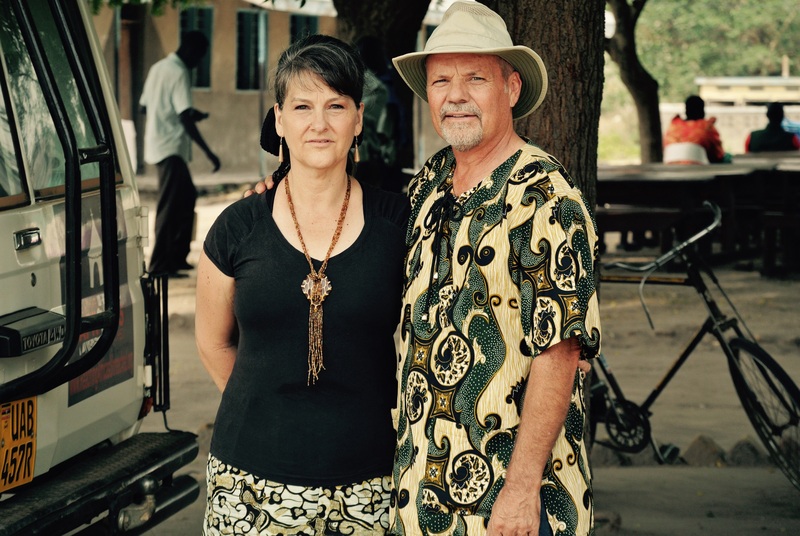 Please pray for her and all Christ’s sheep in Yumbe District. 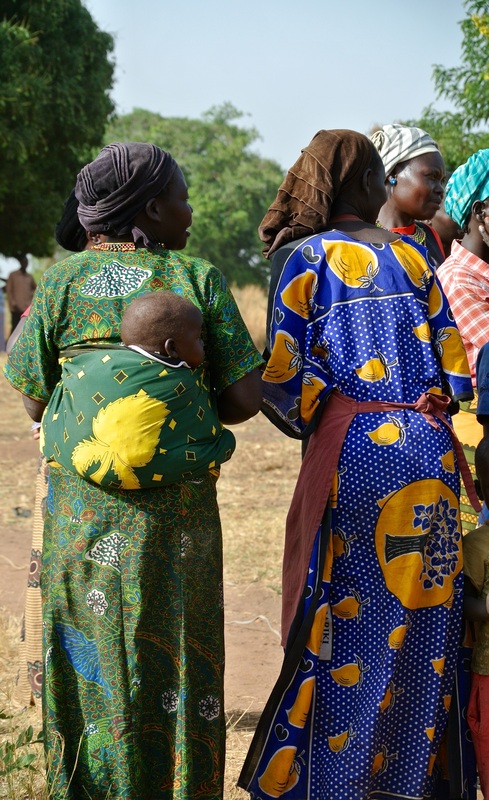 Pray for Yumbe. It is a stronghold of Islam with 95% of its population being Muslim. This is the report we have received from Christian “men of the soil”. 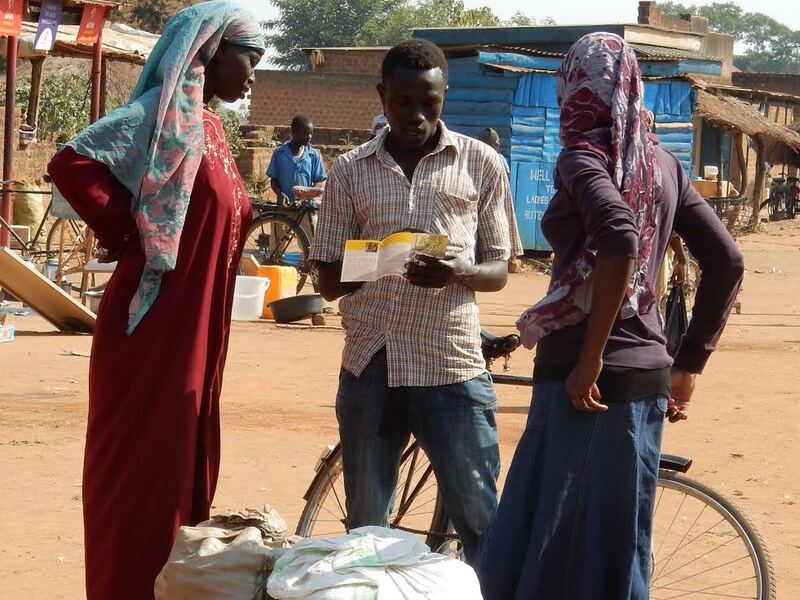 We have just heard back from our contact in Yumbe District that things have gotten worse for this 16 year old girl. Yesterday she was able to secretly get away to meet and pray with us. It touched my heart deeply to be able to meet with her and try to strengthen her with scripture, prayer and our physical presence and assurance. Her maturity as a new and very young believer reveals the hand of God’s grace in her life. We have definite plans in the works but they are best left unwritten at present. Please keep praying for her, her safety, and her family as well as all of us seeking to be Christ’s embrace in her life! Here are a few other updates. 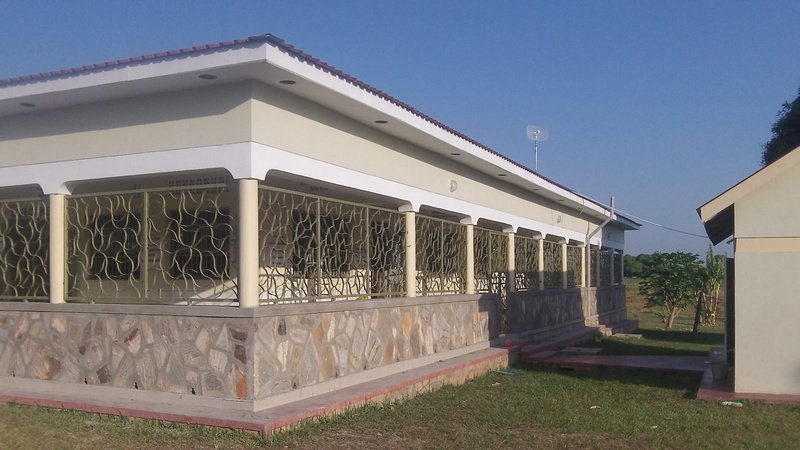 The security wall around the outside of the veranda is finished. It adds another wall of protection and has not taken away from the beauty of the Guesthouse/Hall of Tyrannus. Work continues on the room addition to the tukalu which I previously mentioned. Remaining parts of the land are being cleared for the upcoming growing season. 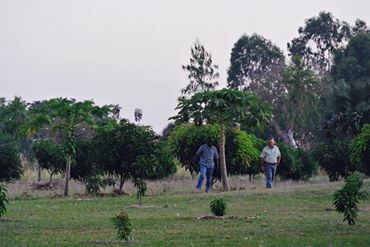 Lord willing we be able to add another 300+- grafted mangoes to the land. This would put their number at 500+. 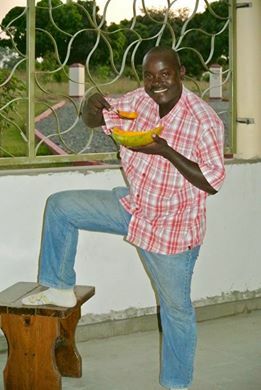 These mangoes will by God’s grace be able to help support the ministry of RAU in the future. We now have hot,rather warm, water for showers. There is a long length of black ¾ inch black pipe snaking around in the attic from our 5,000 liter tank to our showers. The heat in the attic keeps the water the warm. Praise God for warm showers! The downside is that we all will be using more water 🙂 . Because of specific targeted gifts by individuals we have been able to be vessels of help for a number of children, both medically and educationally. We have written in the past about these children and people have been touched by the Lord to specifically meet their needs. 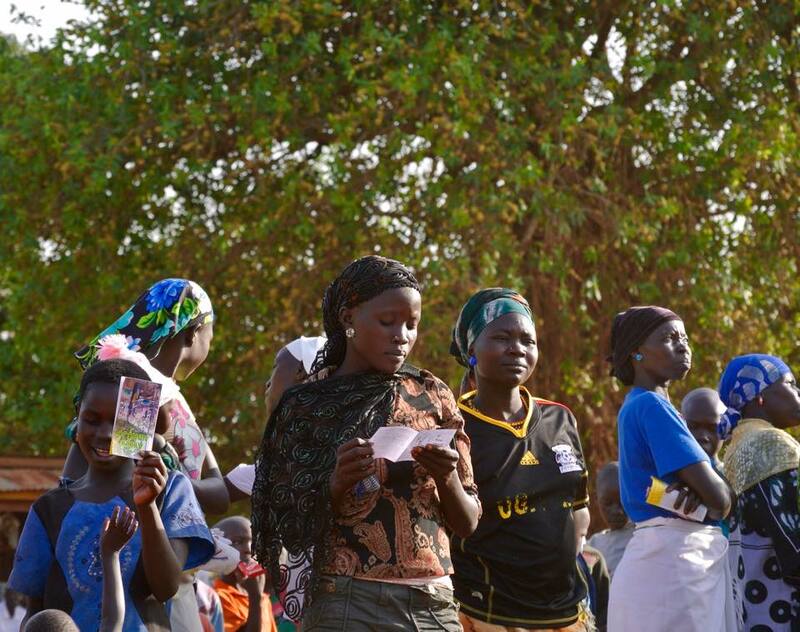 These outreaches are not RAU’s primary mission but we count it a privilege to be a pipeline of help in these ways. 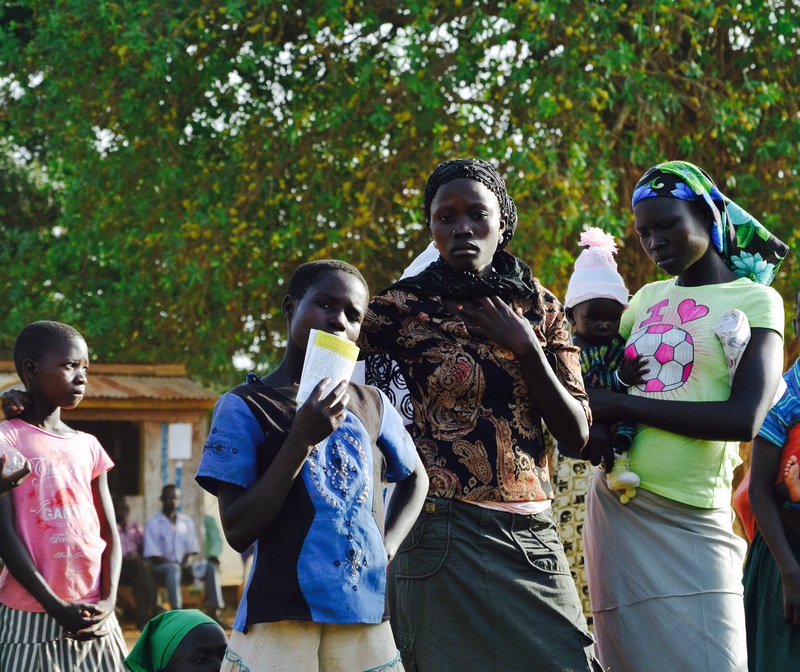 The West Nile region is way behind the rest of Uganda in means and places to help the children. 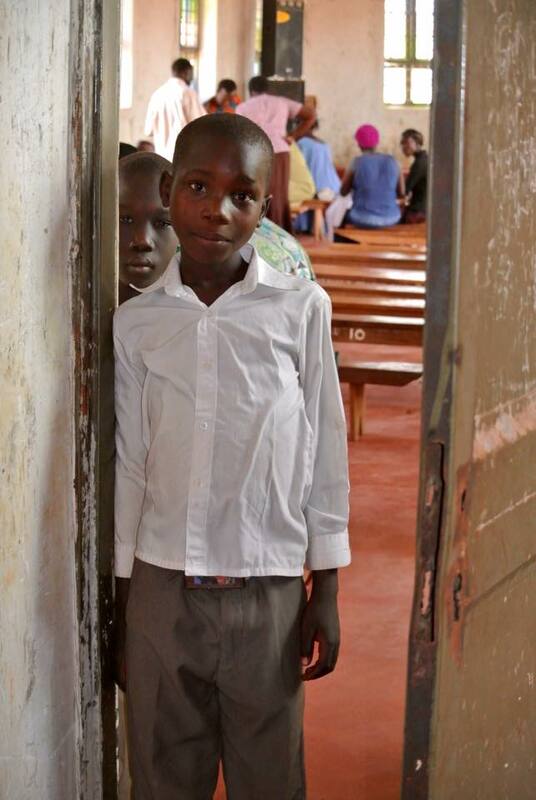 In the last month 8 local primary age children have been sponsored for one whole year of education including room and board at First Presbyterian Covenant School in Kampala. 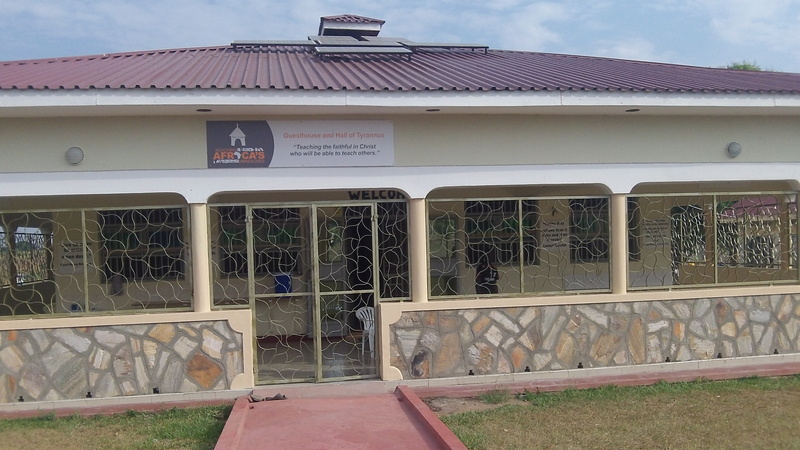 This school is run by the church in which RAU co-worker, Patrick, is a Pastor. In our Moyo area the schools are very crowded (100+ students per teacher many times) and are known to perform poorly in testing. 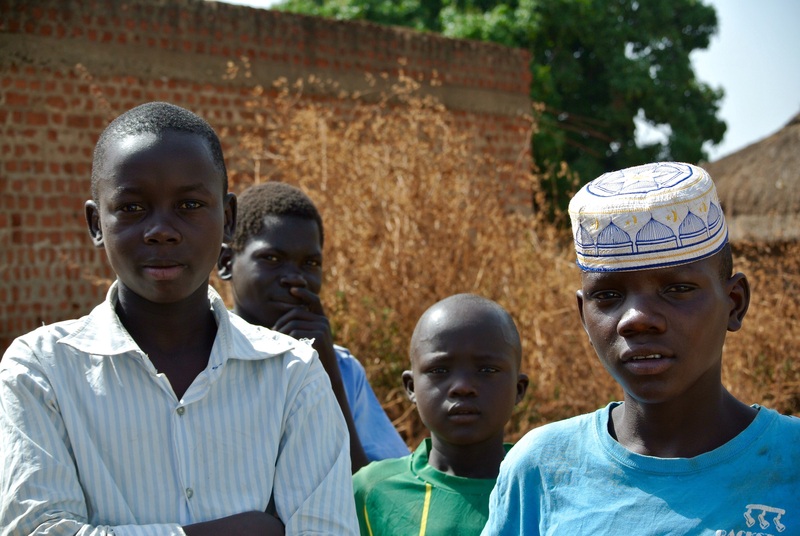 In many cases parents do not have the money to even send their children to school so they remain home with no education. 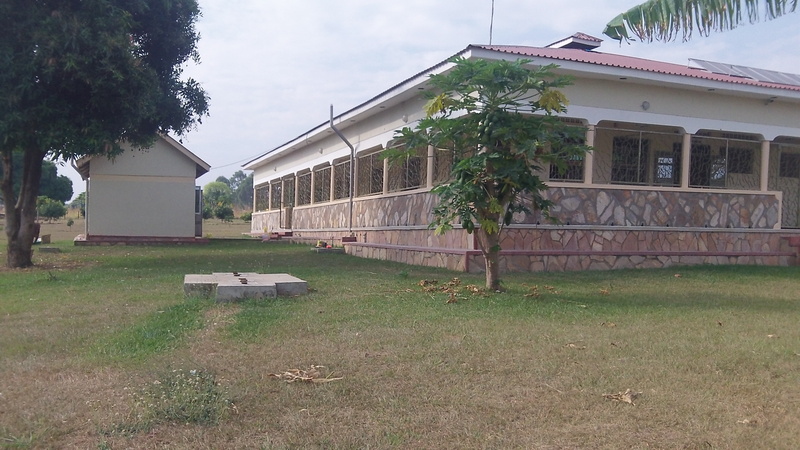 When the Lord opens the way, RAU’s 17 acres has the room to build facilities for a Christian School, but until then this is a way in which we can sow into a young person’s life. It is still not too late to sponsor a child/children for the 2015 school year. Six hundred dollars plus a onetime start up cost of $100 educates and cares for a child for one year at First Presbyterian Covenant! When giving please specify that this is where you want your gift directed. 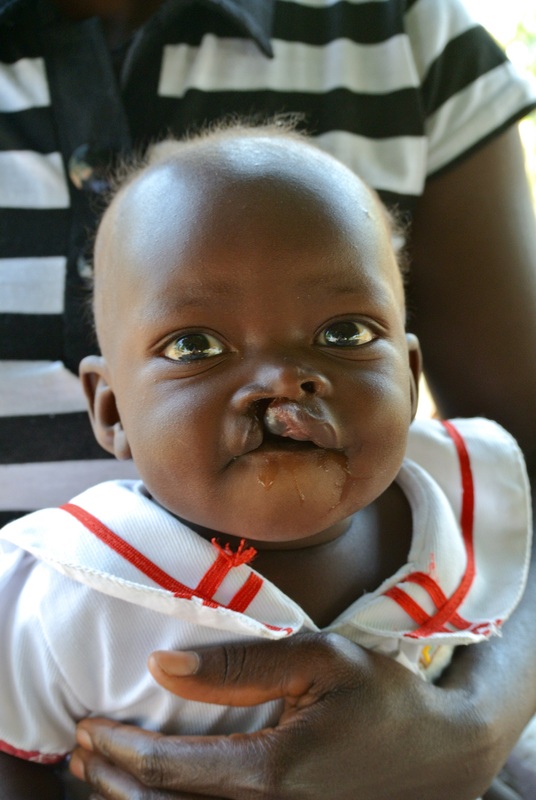 We also have been able to help children with cleft palates/lips (3), hydrocephalus (2), severe club feet (1), teeth issue (1), severe eye problem (1), and various other smaller needs. 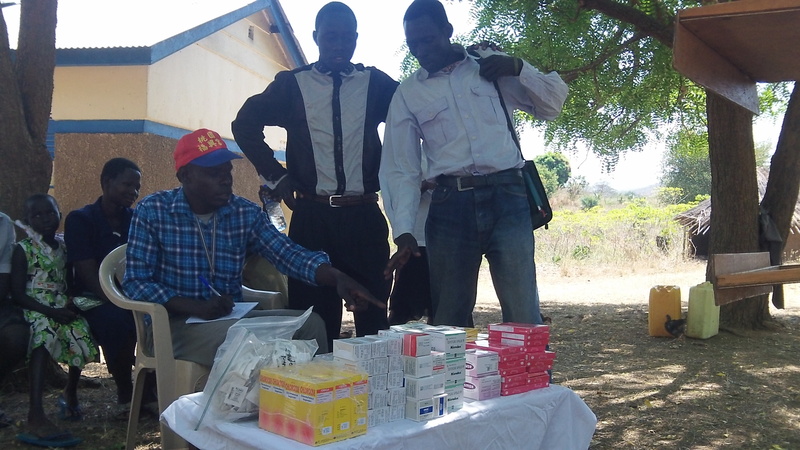 Since the beginning of the year we have given out 1,500 de-worming tablets, 150 anti-fungal creams, many malaria meds, and pain tablets. 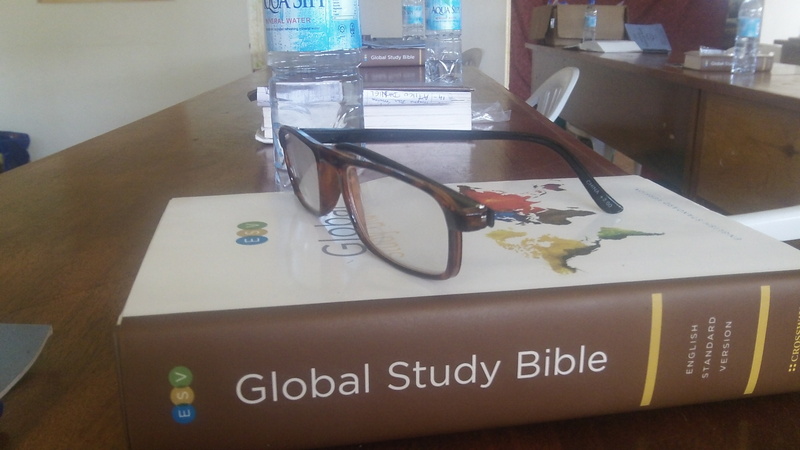 Many, many reading glasses have been given out as well, both to believers and unbelievers. These acts of love touch people/families in a very special way! We only use funds specifically designated for “medical” needs to carry out these expressions of Christ’s love. Carol just came in weeping. A local child was just brought here by her mother who had an umbilical hernia repair at age 3. She is now 7, but looks as if she is only 4 or 5 years old. She cannot eat well as her belly becomes distended and food won’t pass through properly. She often is unable to keep food down. Carol feels that there may be some kind of intestinal blockage which could become life-threatening without some kind of intervention! 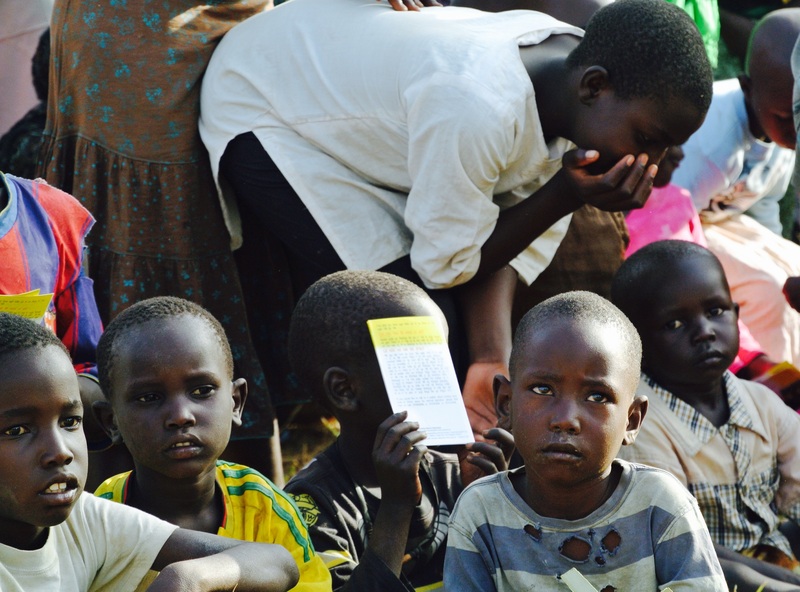 The child cannot be helped here but there are places in Kampala or even Gulu. The expense is in getting to the hospital and having the funds to care for themselves while they are there keep them from being brought to these places for care. 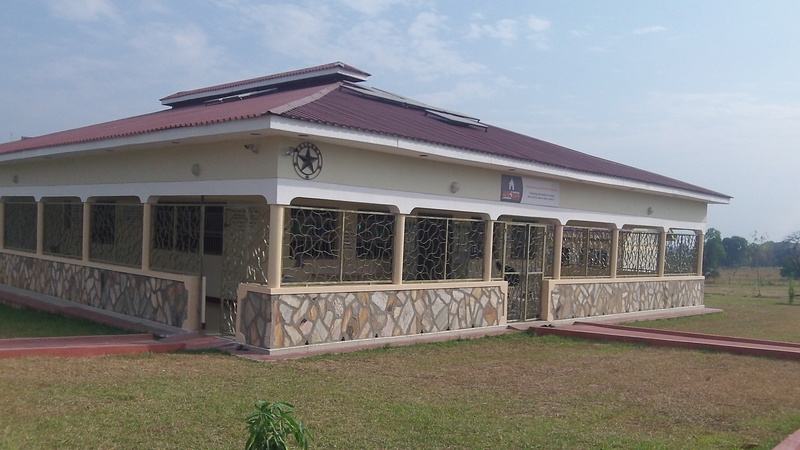 When you give specifically for “medical” needs these are kinds of things we do with the funds. In this newsletter I have written about many needs and have asked you to give. Living on a long term basis here coupled with spending most of my life in America gives me a unique experience. Each of our living experiences gives us unique insights. My prayer is that Carol and I can be your eyes and hands here. One of our goals in writing is to “make you aware” of what we see day in and day out. Effectiveness in doing anything long term does not come as a result of guilt. I unashamedly lay these needs before you, trusting the Holy Spirit to move as He sees fit. As an American and especially as a Christian I know that many “needs” are “laid” before us all. In fact, because of television and the internet we are inundated with pressing needs both in our own country and around the world. What we must all do is ask the Lord in what way we can best serve the cause of Christ with what we have. Most often we do this with those we know and have confidence that our gifts are used properly. As it says in 2 Corinthian 5:10, we ALL, as believers, will have to give an account for our actions at the judgment seat of Christ. Also, our lives are like a vapor; we only have a short time in which to make the greatest eternal impact. It’s not a matter of feeling guilty but being effective. May the Lord richly bless each of you and your families! 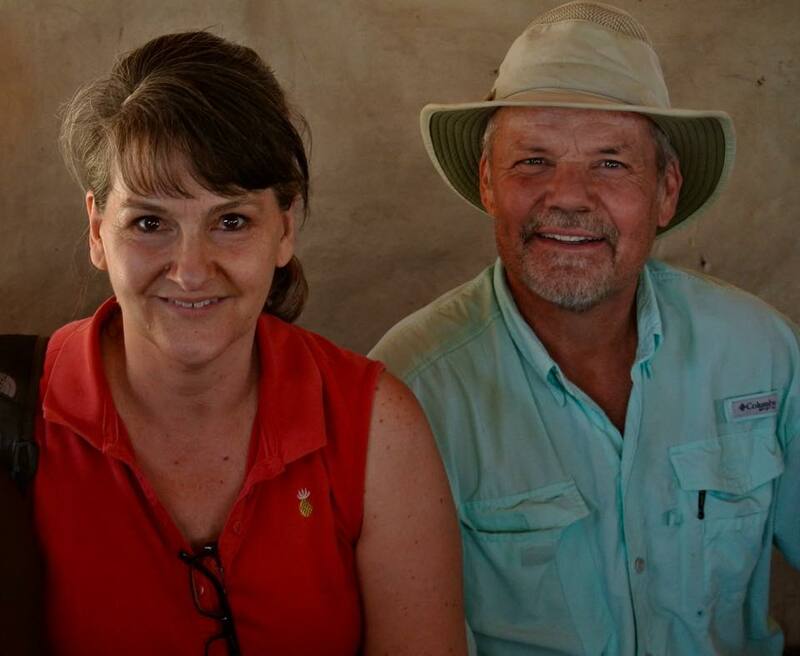 Carol and I are so very grateful for all your love, prayers, and support! What’s Going Up Is What’s Going Down…At RAU! Jacob is good about putting posts on Face Book that keep people current on activities and projects here at RAU, but we realize that not everyone “does” Face Book. We want to lasso everyone “into the know” with this post and email. It has been a season of projects and building and organizing. If there were no seed-sowing, fruit-bearing purpose, it would simply be busy work, but with Jacob there’s always a purposeful plan and he’s persistent, so…we make progress! The perimeter security wall has been nearly finished. It is now just a matter of aesthetics. As you can see from the picture above, the wall serves not only a practical purpose, but pleases the eye as well. Right on the heels of that project a second one has begun. Another room is being added on to “Sam’s tukalu” which will allow a queen-sized bed and a couple of bunk beds. 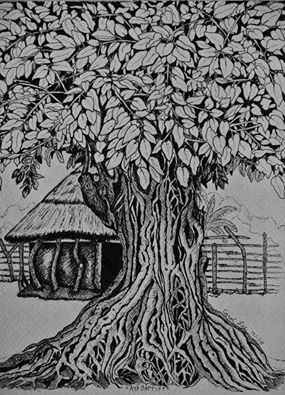 We already have solar panels and a battery with which the tukalu can be “electrified.” The current tukalu already has a bathroom with toilet and shower. As we think about the ministry goals of RAU, Jacob is keeping in mind ways of increasing the number of people who may be served during retreat times. 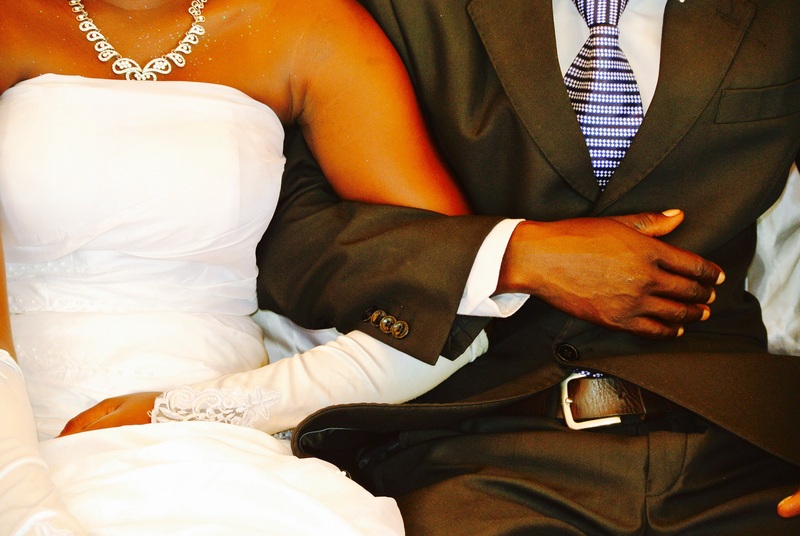 He is also thinking in terms of teams, especially couples, who may come to serve. This tukalu will serve both purposes. 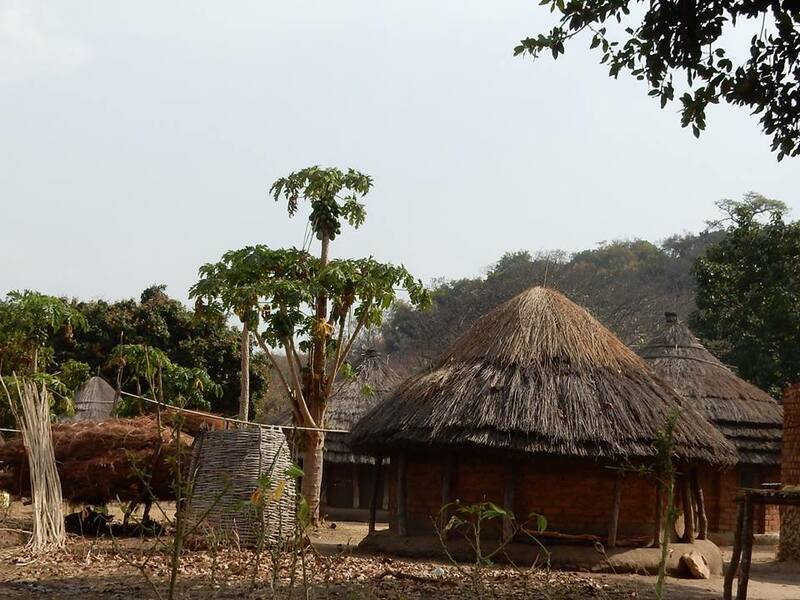 Addition of a room to the Tukalu and the foundation for another container. Jacob continues to walk through opening doors. 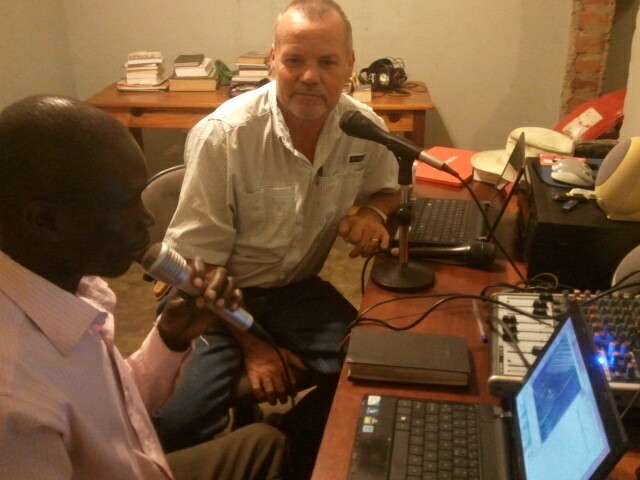 Tuesday the 20th he will have an opportunity to preach over the radio airwaves via the local Christian radio station. At the end of the message people will be able to call the station with questions or comments. I believe we have mentioned before that this could become a regular event. 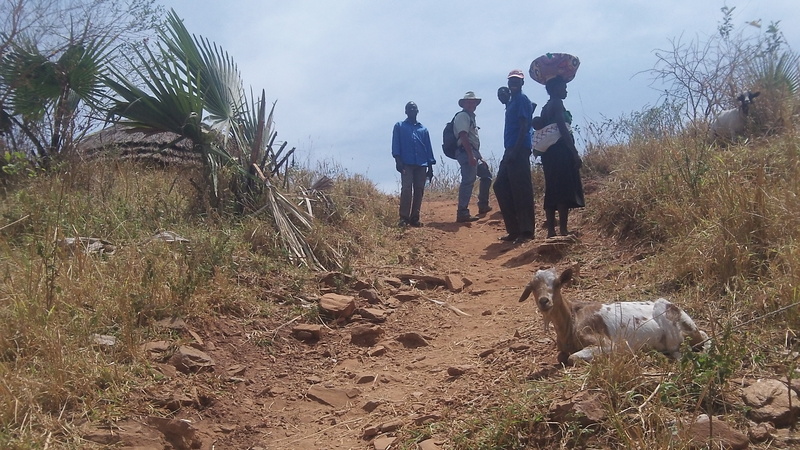 In the hills nearby the radio station, Aya Baptist Church has been busy reaching out to its neighbors in the remote areas of Gbare (pronounced, “Bar- ay”) and Arapi (pronounced, “Ah-rah-pee”). They are in the process now of discipling new believers in Jesus and sending one of their own to move to Gbare to pastor the newly formed church. 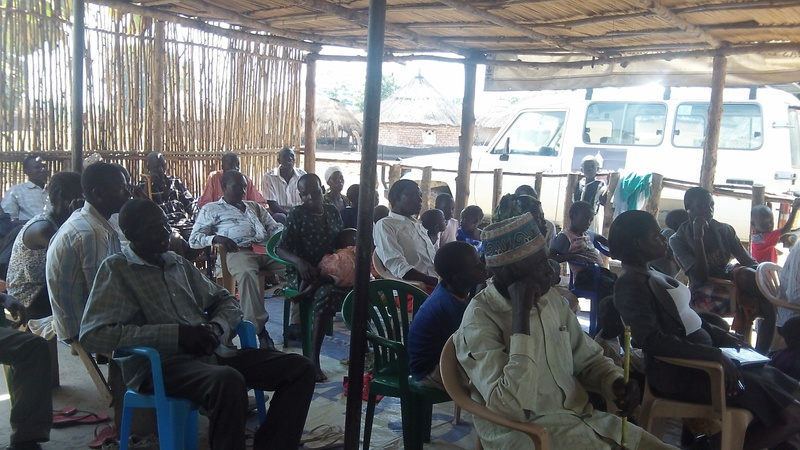 Last Sunday there were 81 people who attended church in Gbare, at least 60% of which were new believers from the last month of evangelism. 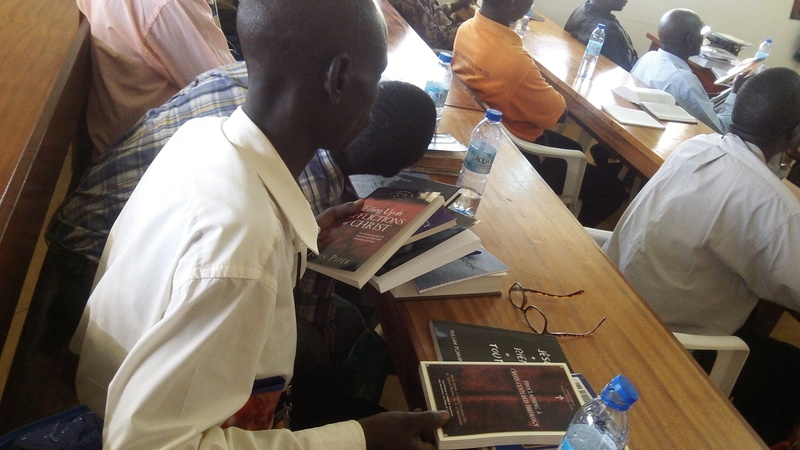 RAU is partnering with Aya Baptist Church to see a good work established and to see the roots of the church grow deep in love for and obedience to the Word of God. This coming week, on Wednesday, Jacob and Zora (our new ministry intern) will head up to Gbare for some time of discipleship and instruction as well as the basic good of some de-worming medicine. Please pray for this work. 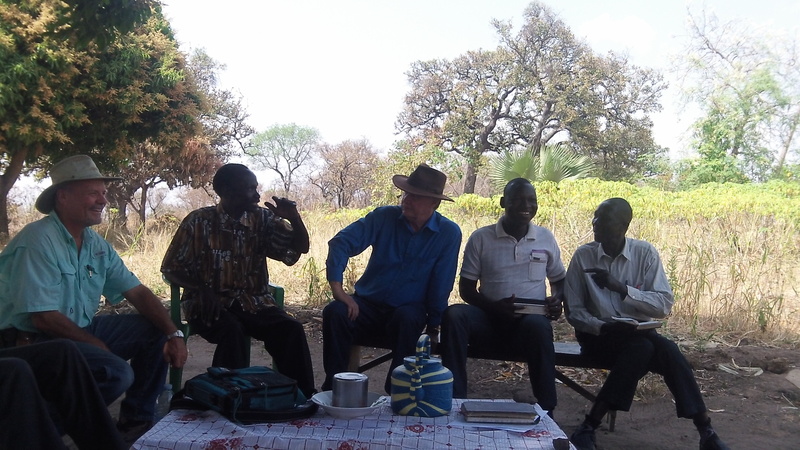 On Sunday the 18th, Jacob, Zora and Mindra (one of the men who works here at RAU) drove to Yumbe where they were met by Charles. 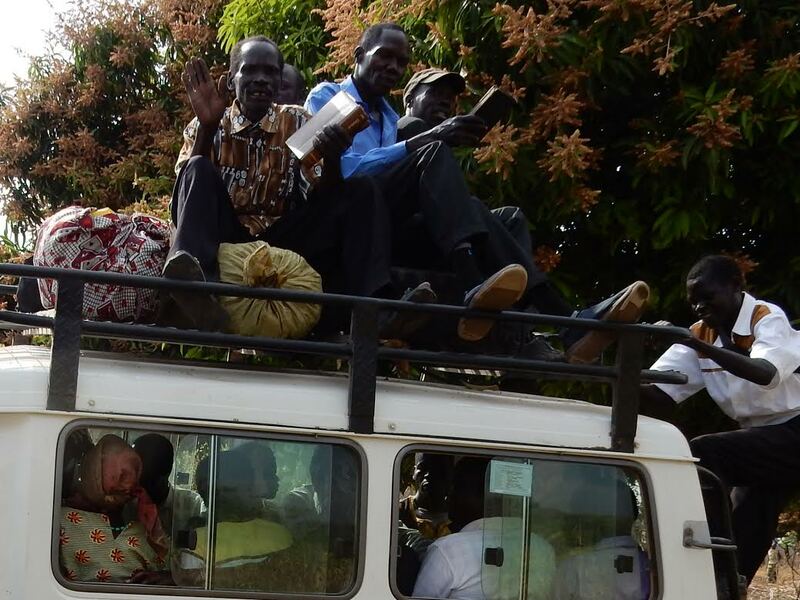 Charles took them to Ambelecu, one of the Church of Uganda (COU) congregations in Yumbe District near the Koboko border. 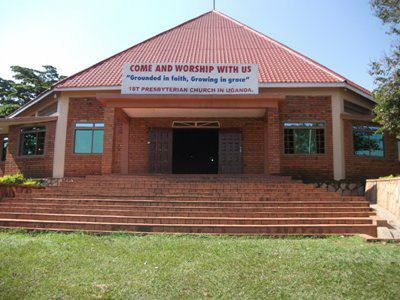 The COU (also known as the Anglican Church) is a solid presence amidst a devout majority Muslim population. 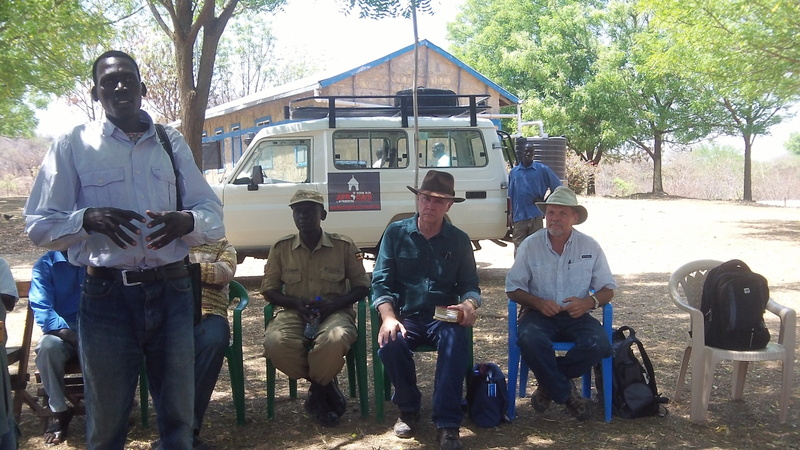 It is a very urgent and major goal of RAU to come alongside believers in an area where it is becoming increasingly dangerous and difficult to be a Christian. Praying and thanking the Lord for safe arrival to Ambelecu COU. 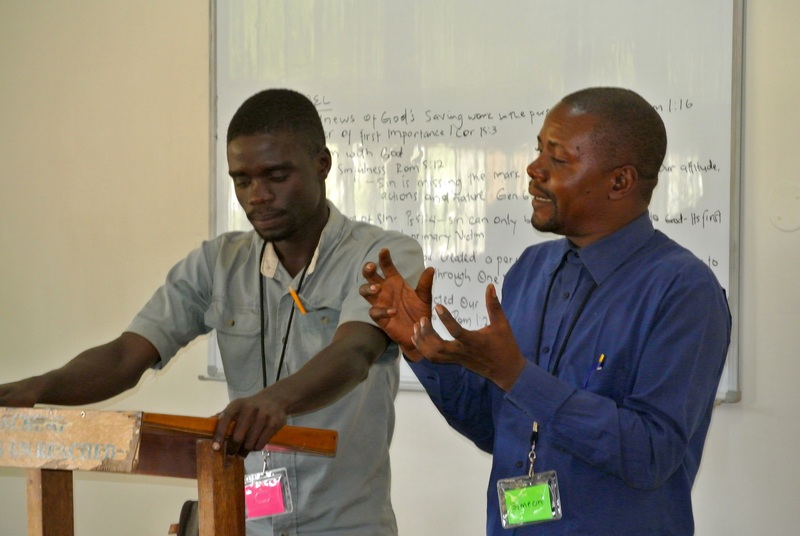 Jacob preaching the Word and Charles interpreting. Praying over those who responded to the message to forgive from the heart because they’ve been forgiven. 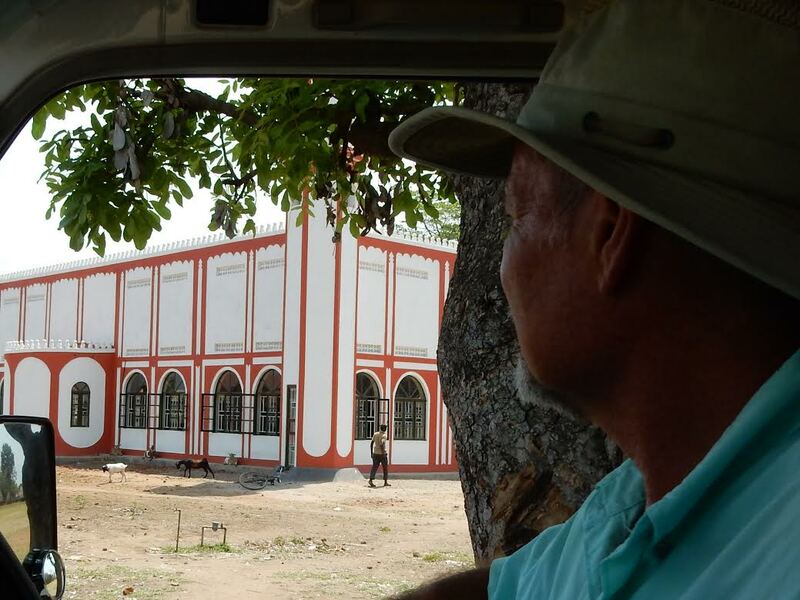 On Sunday the 11th, Jacob, Sam and Zora went to Obongi to strengthen Pastor Godfrey’s congregation, Obongi Town Church, in the Word as well as to stand with Godfrey amidst some intense opposition which he has been experiencing. Keep praying for him and his flock. His experiences give us a current depiction of first century church problems such as are recorded in the Book of Acts where Paul went from place to place, experiencing hardship and opposition wherever he was. 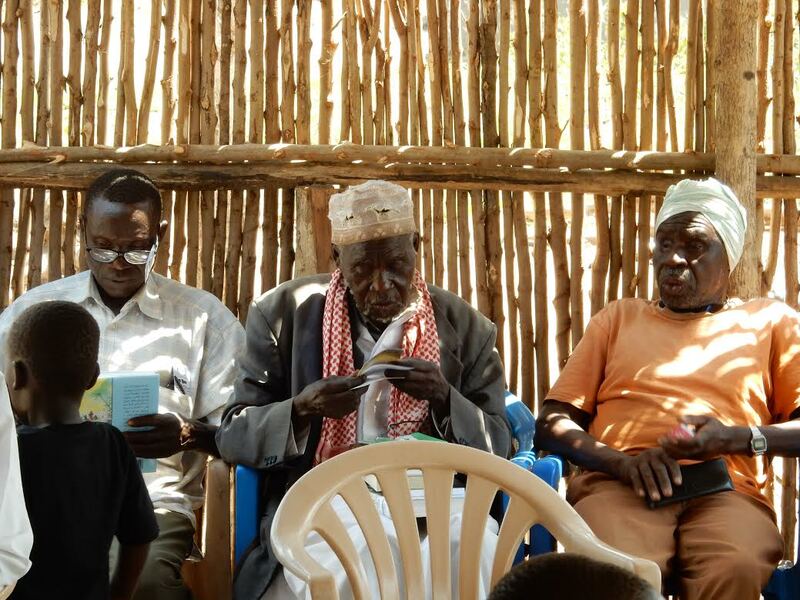 While Jacob and the guys were there in Obongi they took the opportunity to provide reading glasses, tracts and medicines to those who had gathered, most of whom were Muslims. 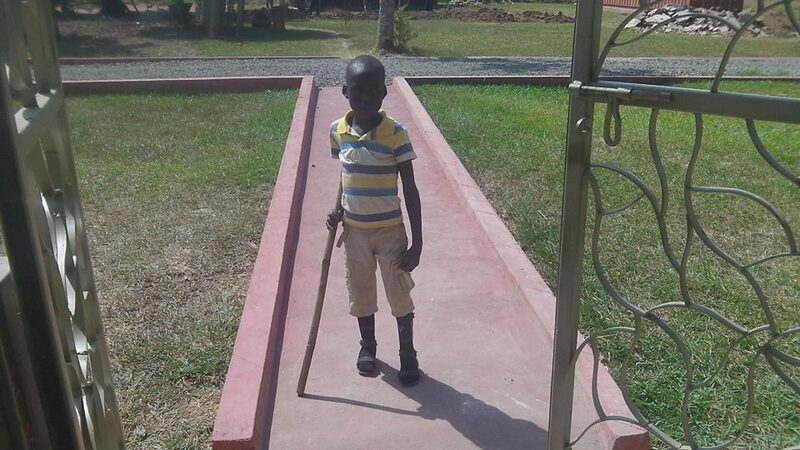 In one of the last posts, we had mentioned the need for education sponsorship for Richard, who has received surgery for club foot. Within two days, a brother came forward to offer the amount needed for Richard to attend First Presbyterian’s Covenant Junior School! When we told Richard’s father, he was thrilled, as you can imagine, for his young son (for whom life had thrown a curve ball) to receive such an opportunity. In addition, Anzoa, the young girl who received corrective surgery for congenital cataracts, also received a sponsorship. 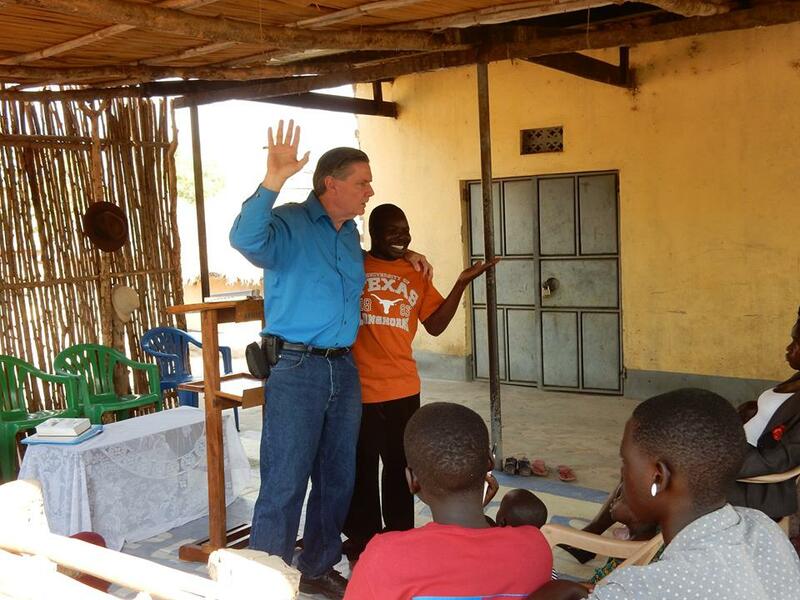 A brother in America is working on meeting a goal to find sponsorship for 18 more local children. 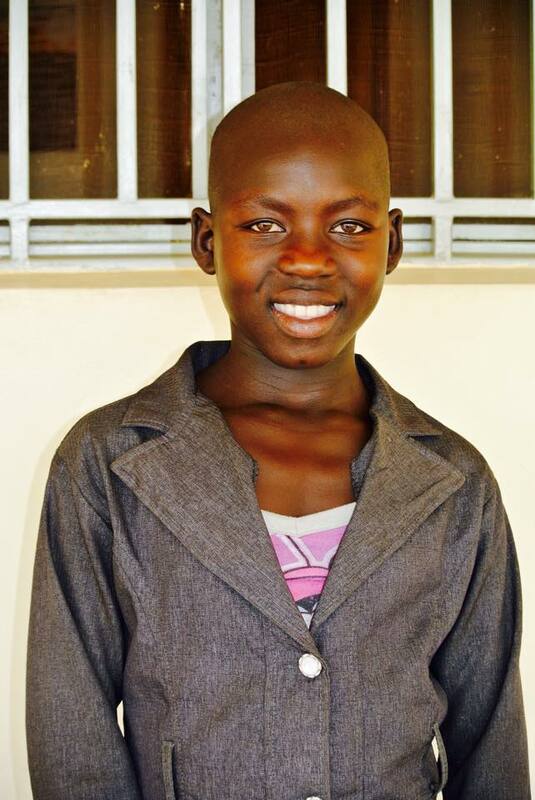 (For one year, it costs $600 to board and educate and provide uniforms for one child.) In America, we take a decent education for granted. 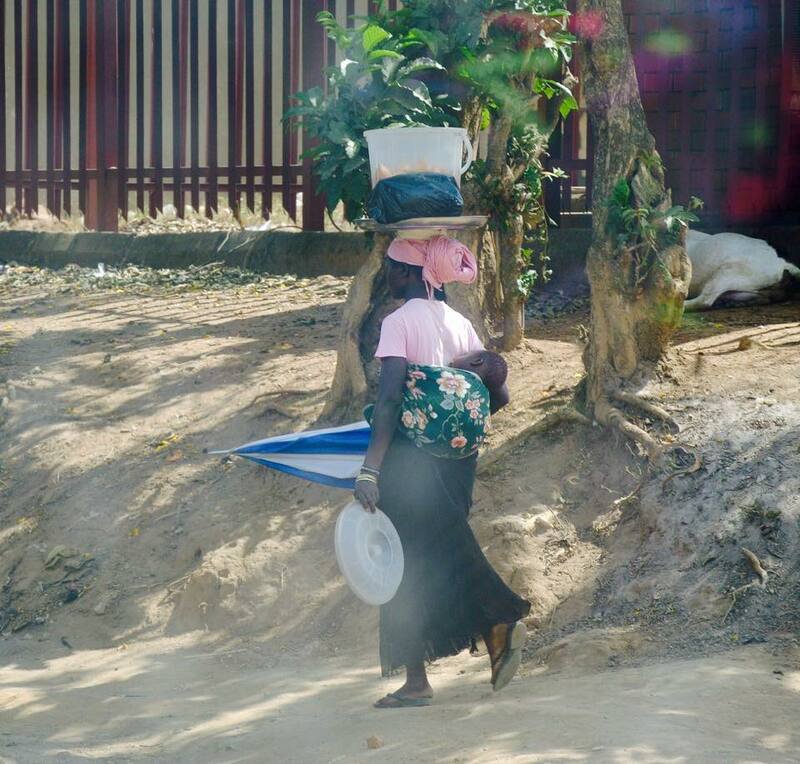 Here, people struggle to find ways of getting their children into school and keeping them in school. The older the child, the more expensive and, therefore, the harder it is to keep them in school all the way through to graduation. If anyone is interested in sponsoring a child please contact us. During the writing of this, a young father came with his child who has hydrocephalus (or some other congenital abnormality.) It is the most expensive of corrective surgeries in which we have been involved because it typically requires numerous follow up visits to the hospital and we rely on special donations for these medical needs that present themselves to us. If the Lord lays it on your heart, we would love to take part in helping this child’ s life and lot improve! You may designate a donation specifically for “the hydrocephalus child“. Thanks in advance for placing your life and resources at Jesus’ feet to be used for His glory in this child’s life! Not long after, just today, a mother brought her little 6 month old baby girl, named Charity, who has a cleft lip and palate. She is asking for help to get the corrective surgery for this. We, in turn, are presenting this need to you all, hoping that your compassion may be kindled for this child. 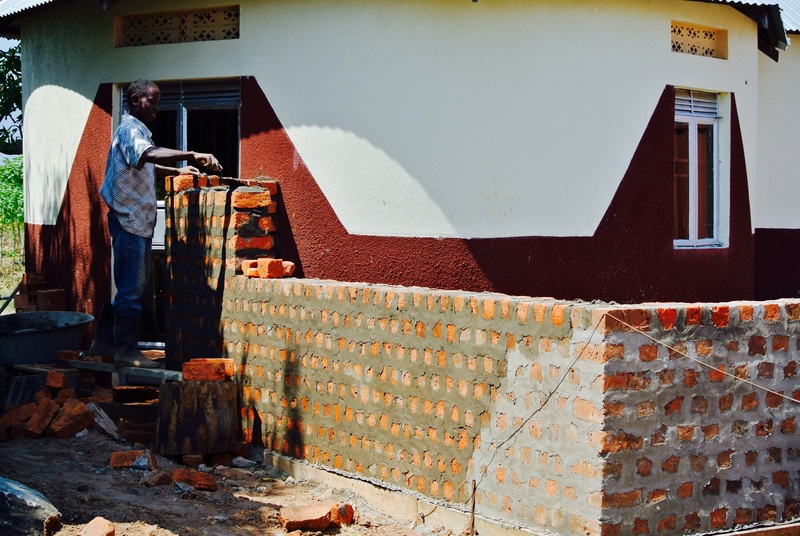 While the surgery is provided free of charge at CoRSU Hospital in Entebbe, the cost of transporting the mother and child back and forth 2 times as well as providing their up keep while there is what costs. From our past experience, the cost comes to about $800. Any amount that is left over will be kept for the next child who has a physical need. 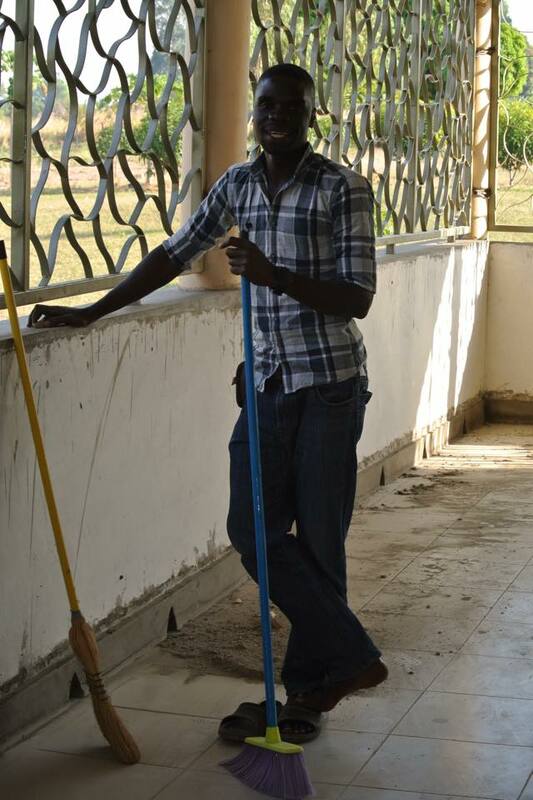 We feel an empty space which Sam has left in his moving back to the Kampala area to further his medical education. We have been so blessed to have his friendship, his commitment to RAU’s vision and goals, and his talents. 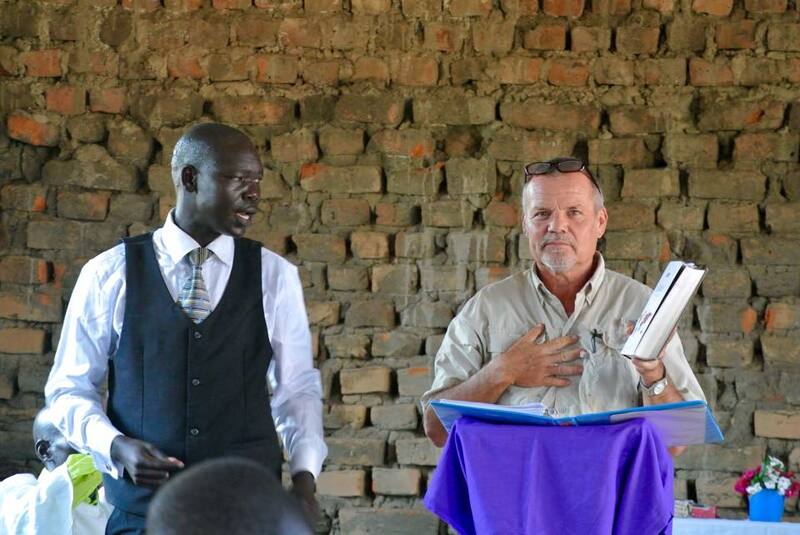 He has been a great help to Jacob and a great help in making the vision of RAU a reality. We are grateful for the Lord’s provision for Sam – getting a Bachelors Degree in Nursing is a three year process and is not cheap! The Lord is good. Sam, we wish you very well! We will miss your joyful heart and your beautiful voice leading us in praise! 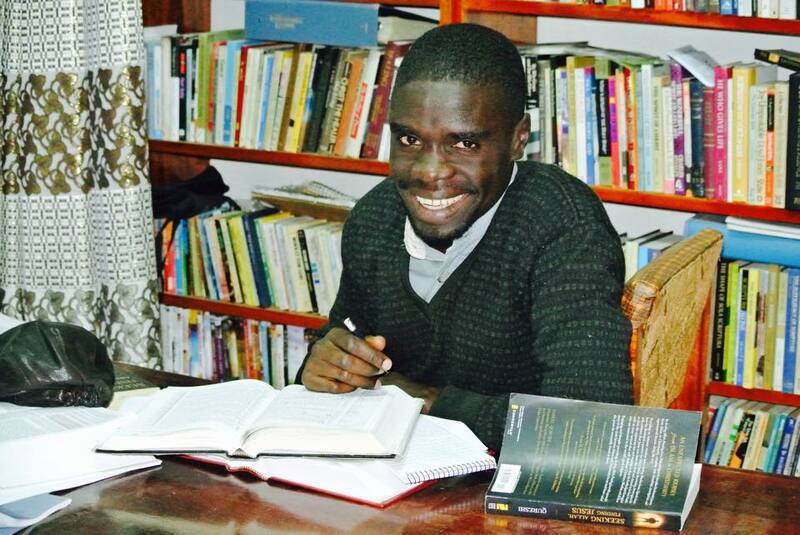 Providentially, the Lord has brought us a young man to intern with RAU – Achidrii Onet Zora. 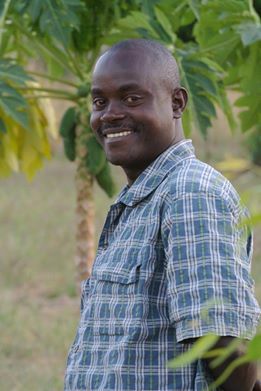 Zora completed a two year theological training at African Renewal University, a school which is greatly supported by Desiring God Ministries. Zora has shown himself to be servant-hearted, willing to put his hand to a broom or a hammer or the dishes, or to help Jacob organize books and other resources. He is an “eternal” student, one who likes to ask questions that open up great biblical discussions and who is humble in receiving insight as well as in adding his own insight to the conversation. 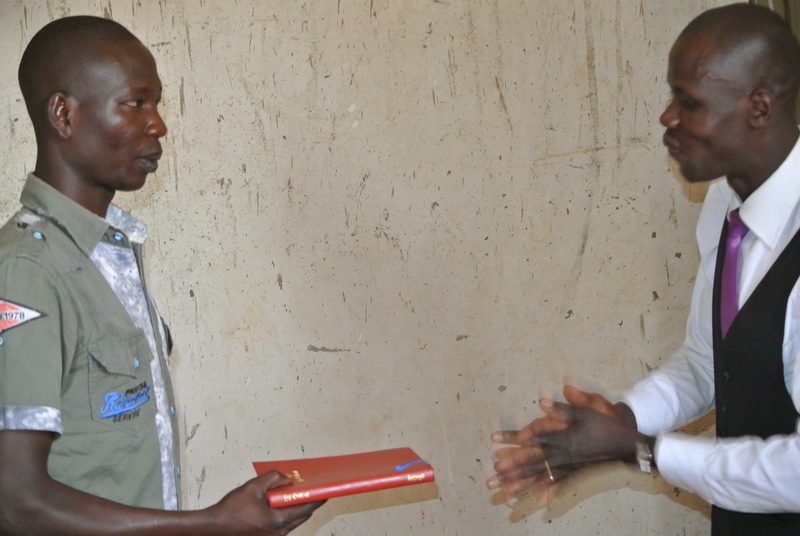 Jacob has given him opportunity to prepare and give a teaching or a word of encouragement which he has not only done willingly, but with an earnest desire for feedback by which he can grow in serving in this area. Zora enjoying the library books! A man after Jacob’s own heart! Handy with a broom, too! This weekend we look forward to the return of our dear friend, John Howarton. 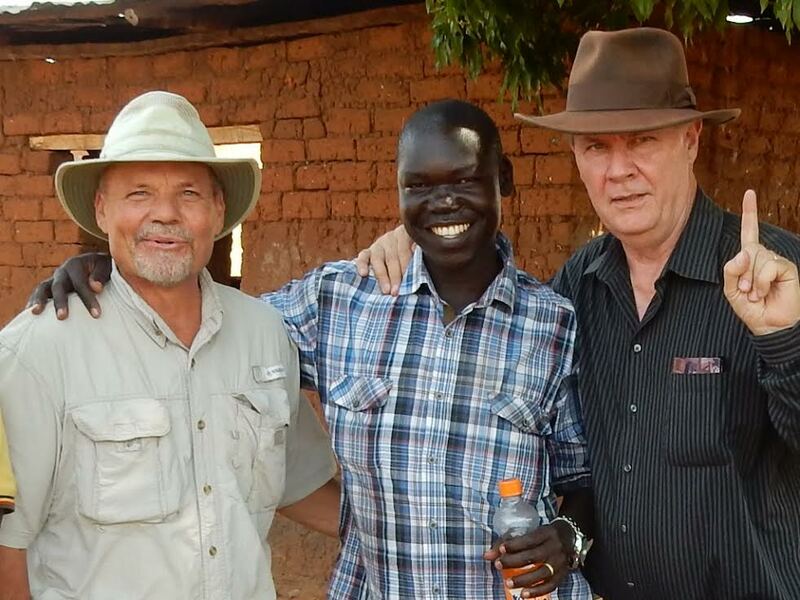 He has already been ministering in Ethiopia and South Sudan. Shortly after he arrives we will be hosting another pastors’ retreat in which John’s teaching gift will be used and appreciated. I (Carol) am back to my “normal” self. We will leave out any description of what that word, “normal” might mean for me! On advice and reminder from my brother, Dave, I am staying home from the bumpy day trips to allow any unseen injury to heal which might have occurred from the jarring fall I experienced a few weeks ago. I am enjoying some time to work on my skill set: drawing/painting and my latest interest – ink. We hope that, as you read about our adventures (and misadventures! 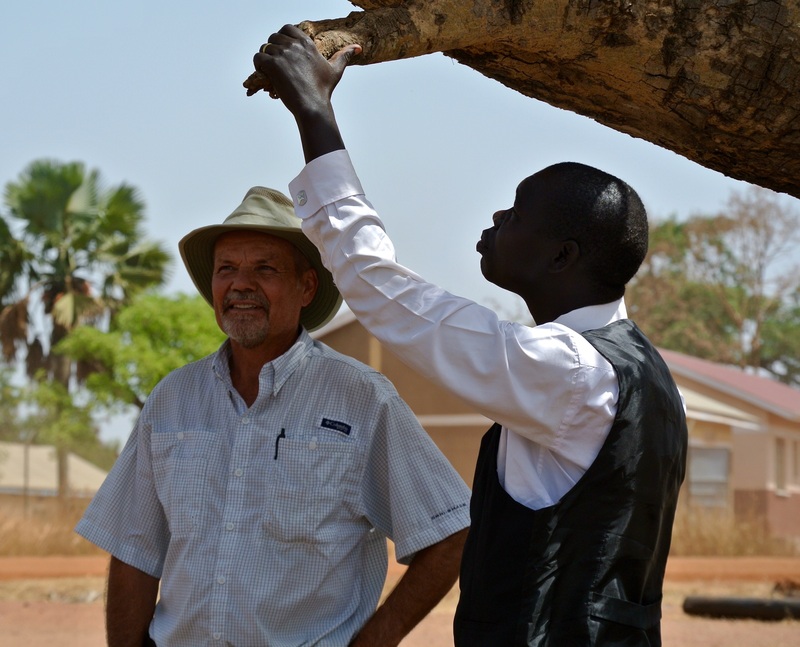 ), and as you pray for RAU, you may also be asking the Lord if you can serve with us here on a more permanent basis. There is more than enough for one man to do and it would be awesome to have a others working together with us here. For starters, consider coming for a short stay to see how your gifts could be used in a greater way to serve the people of this under-served area. May the Lord bless you all! We pray for the Holy Spirit to fill you all with joy, obedience and eyes to see the joy beyond the Cross!